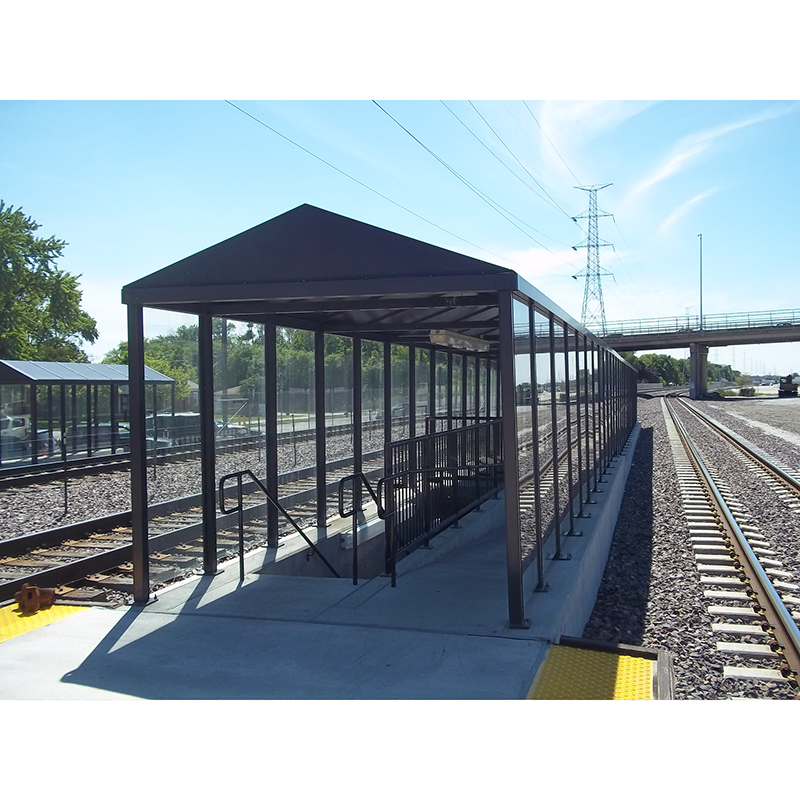 The perfect fit for communities enhancing their BRT and rail systems. 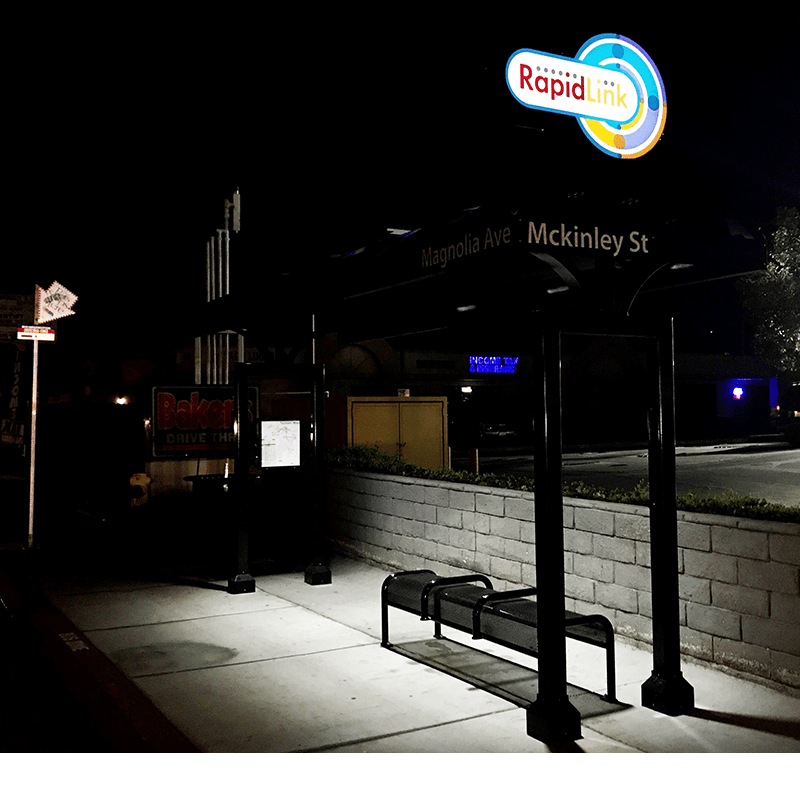 Our BRT/Rail Series works in concert with communities focused on streamlining their transit systems through bus rapid transit and rail services. 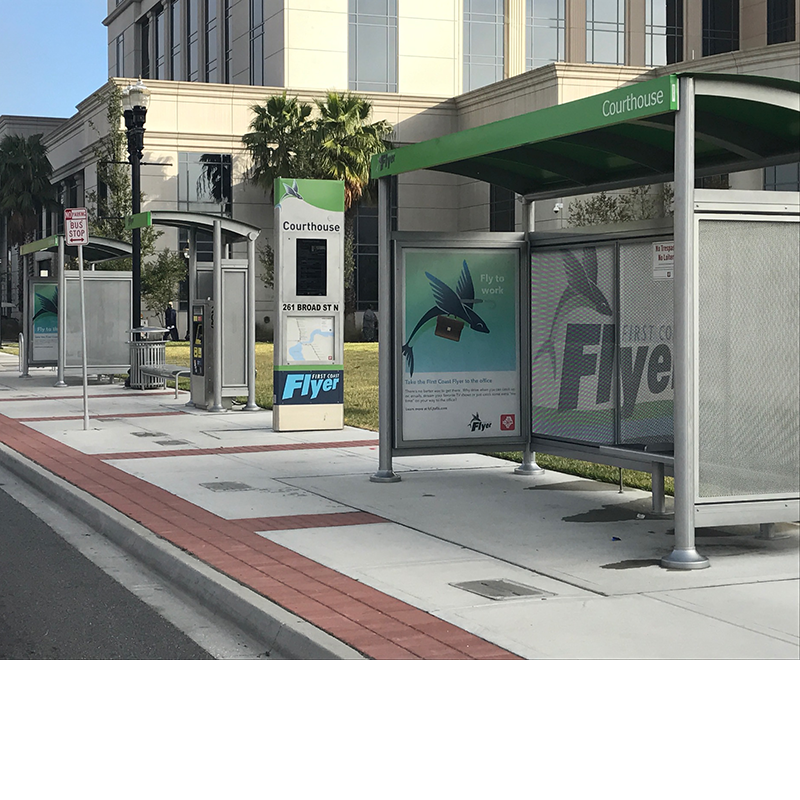 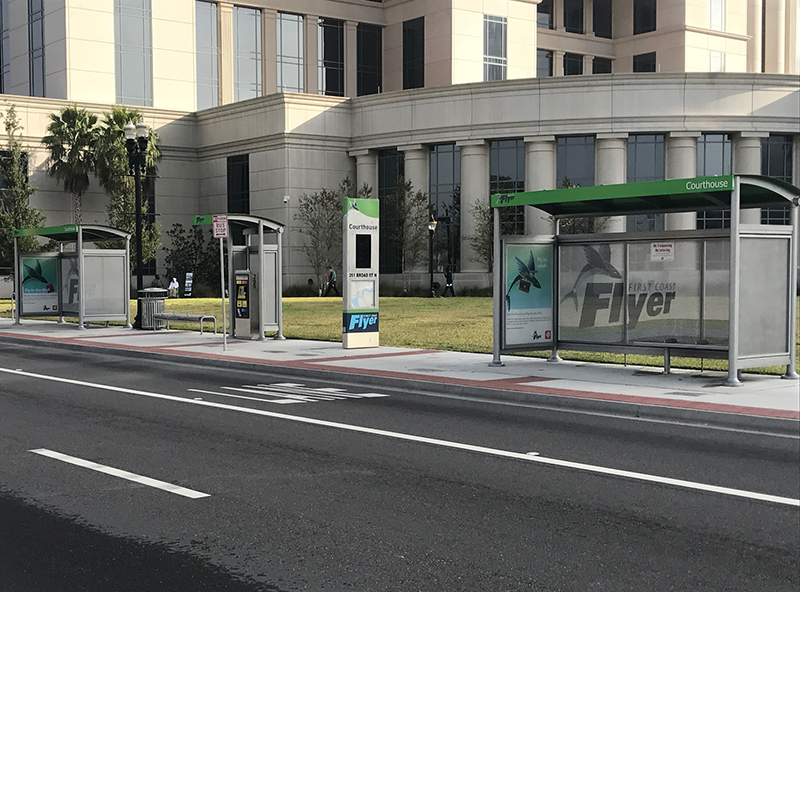 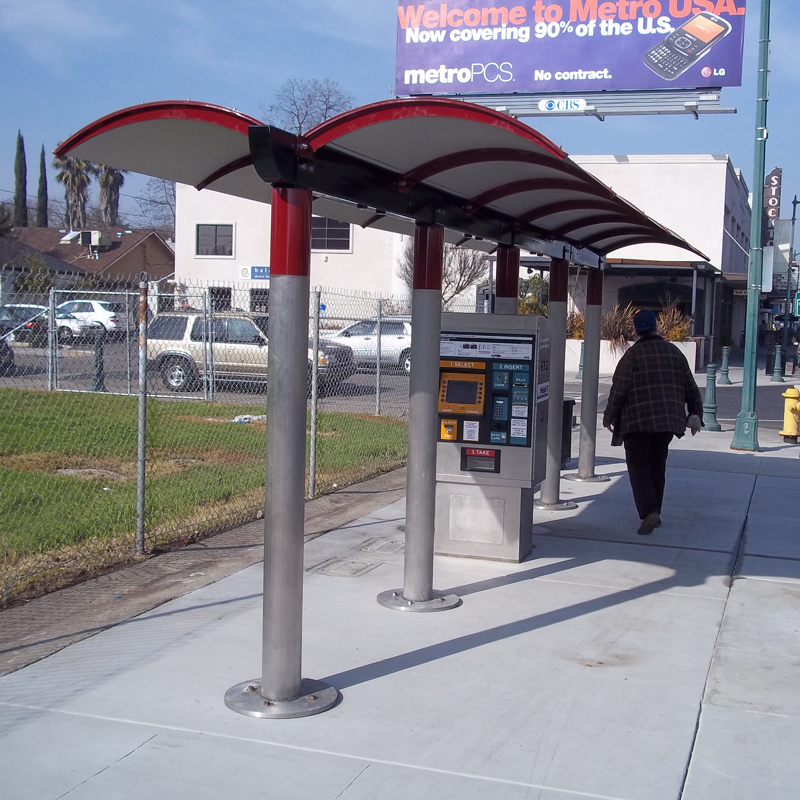 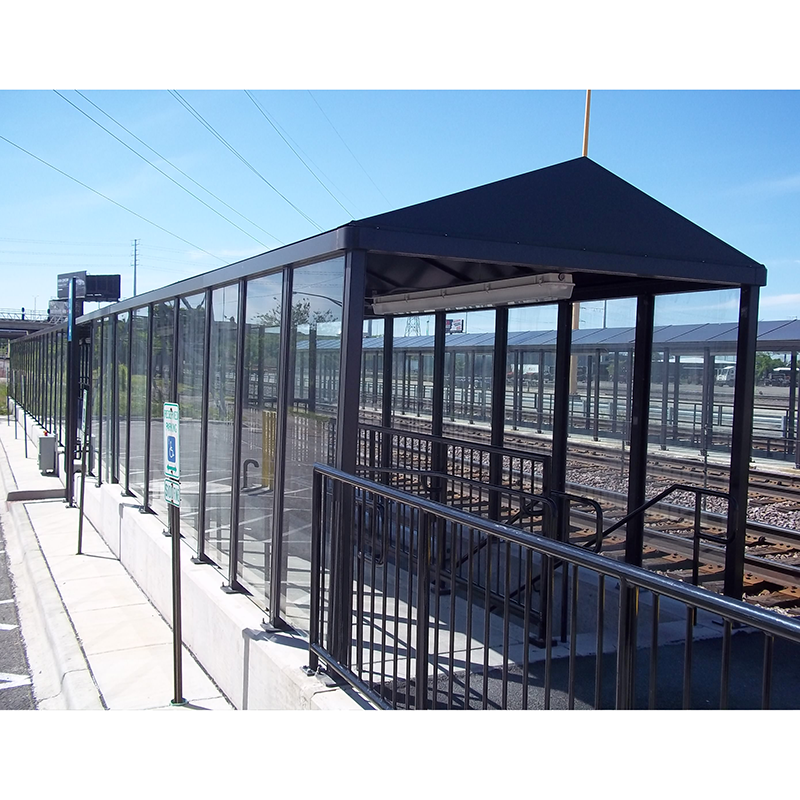 The sleek lines and modern twist on traditional bus shelters results in a BRT/Rail shelter that creates a stylish Sense of Place™ for fast-paced metropolitan cities. 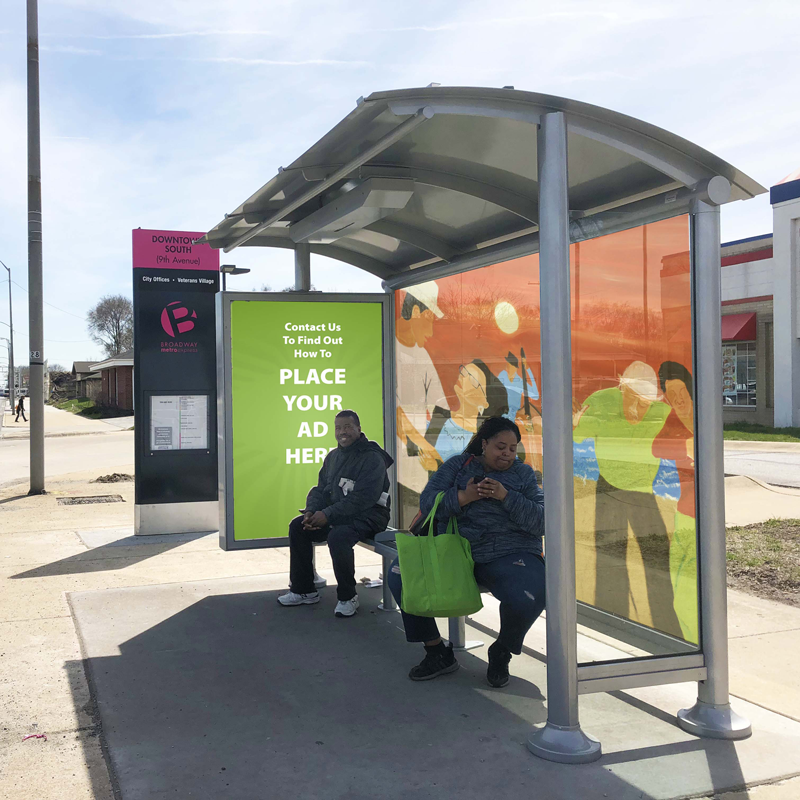 And with options like solar-power, smart device connectivity and digital advertising/information displays, your community will appreciate your commitment to innovation. 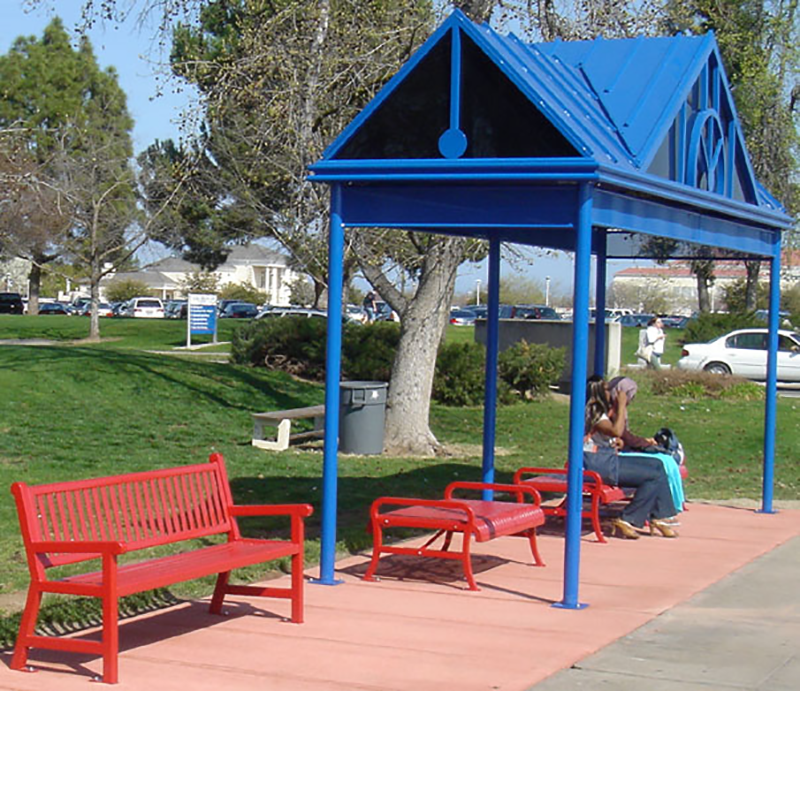 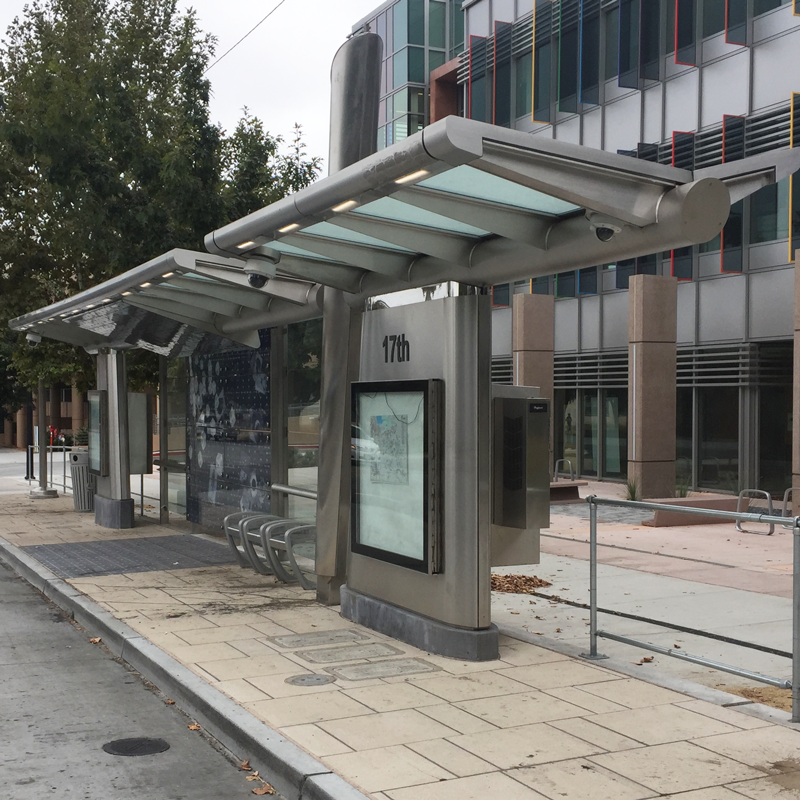 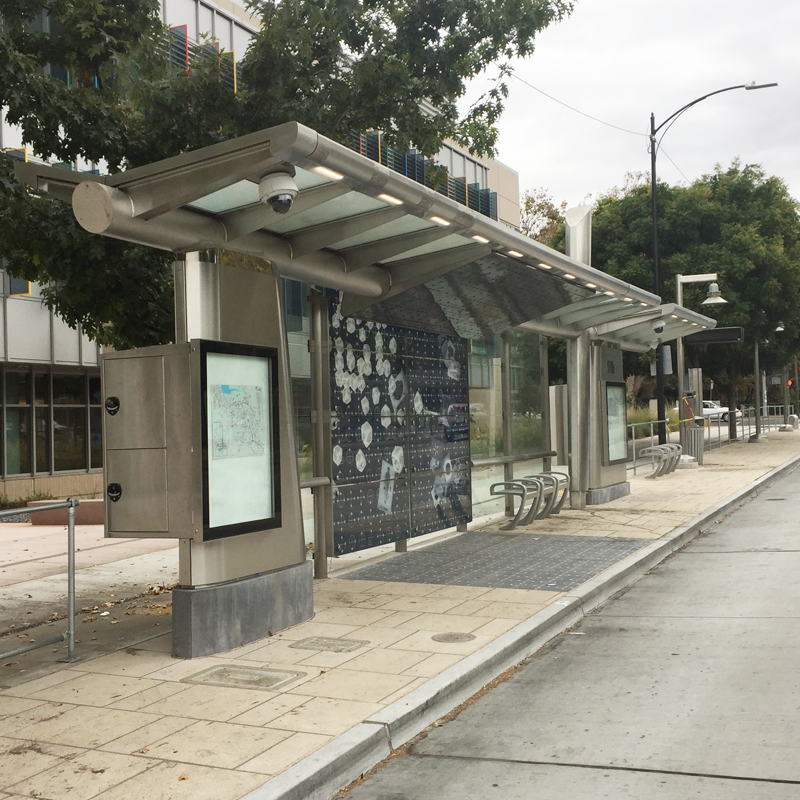 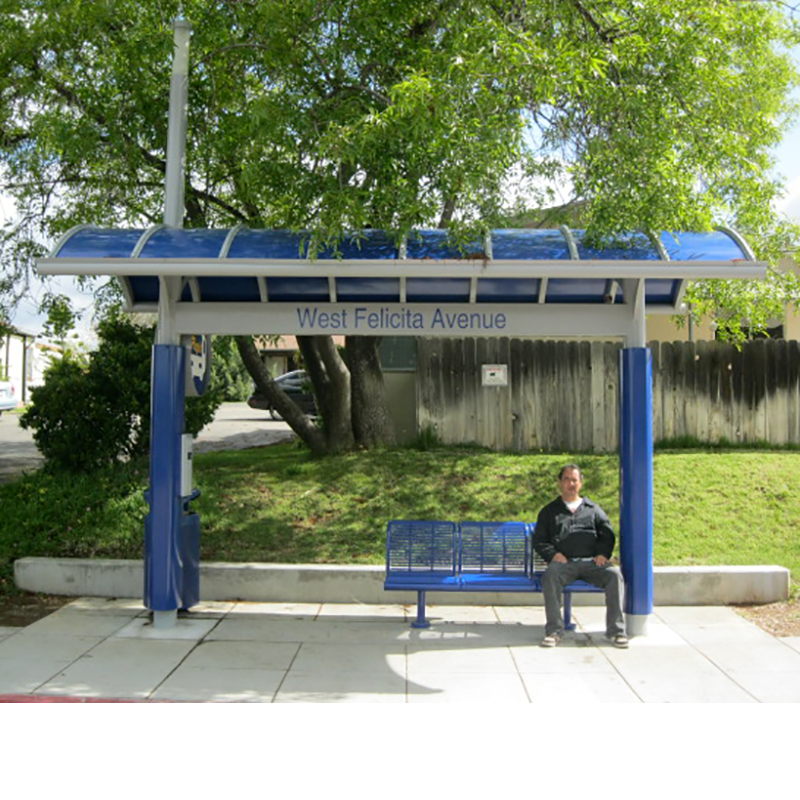 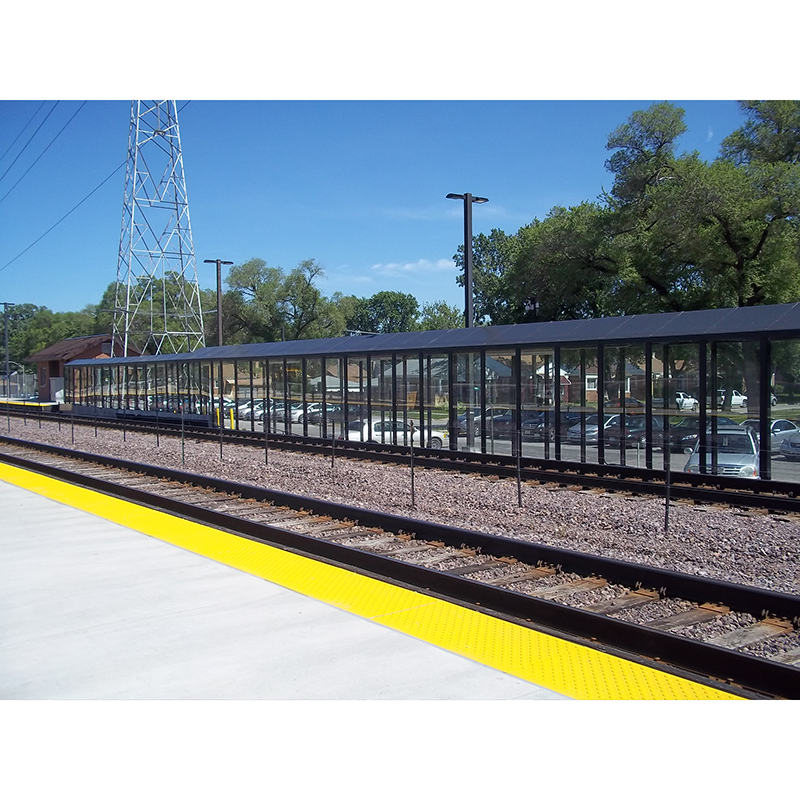 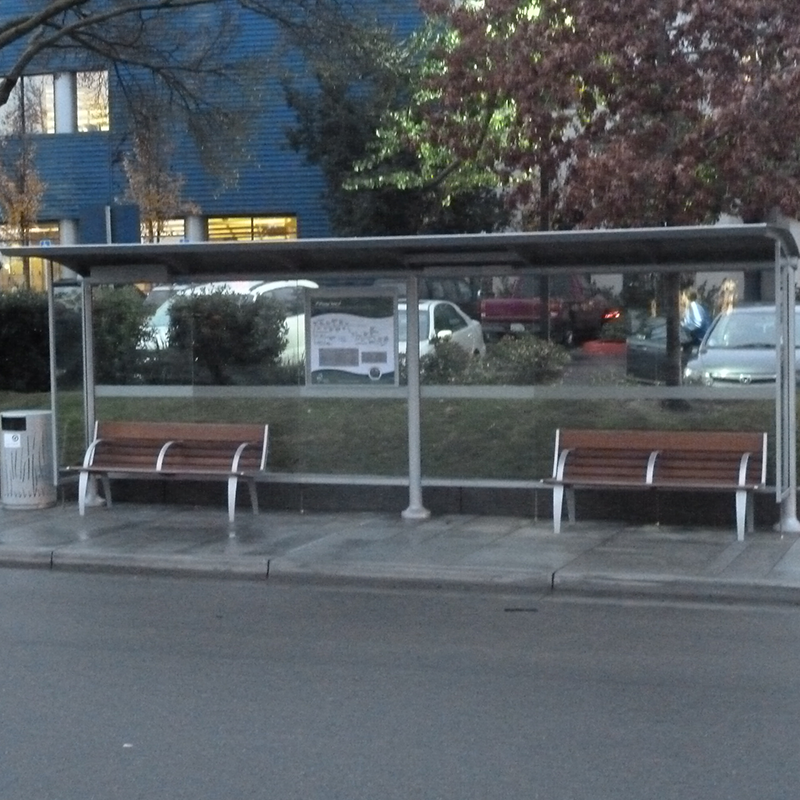 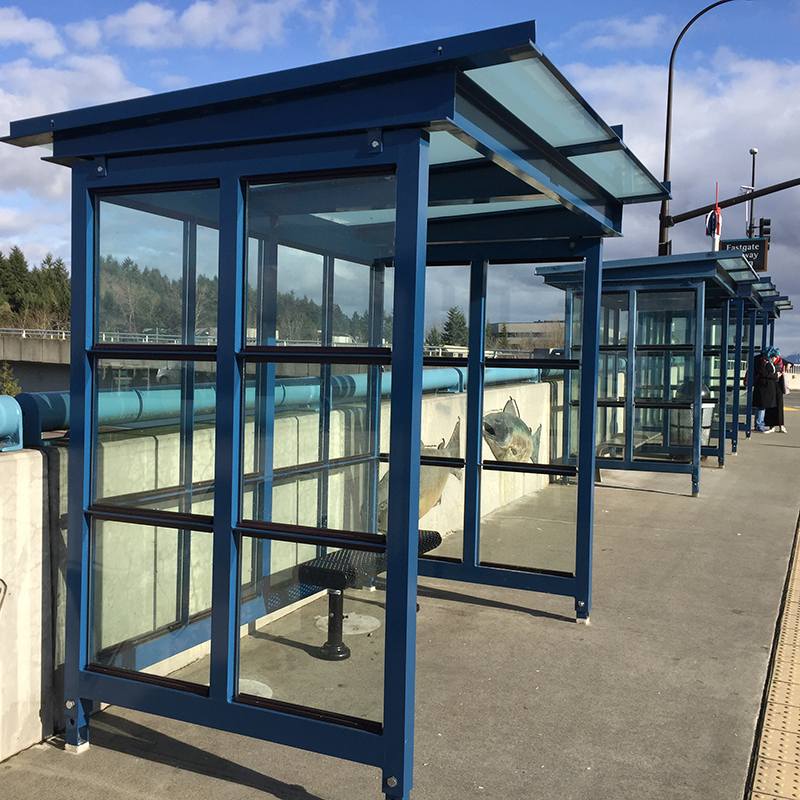 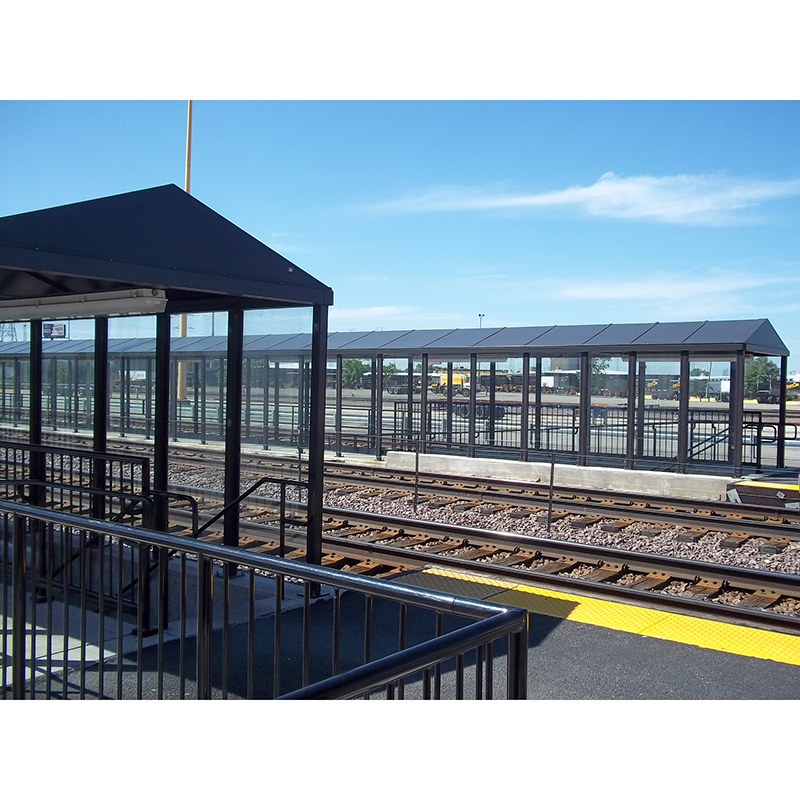 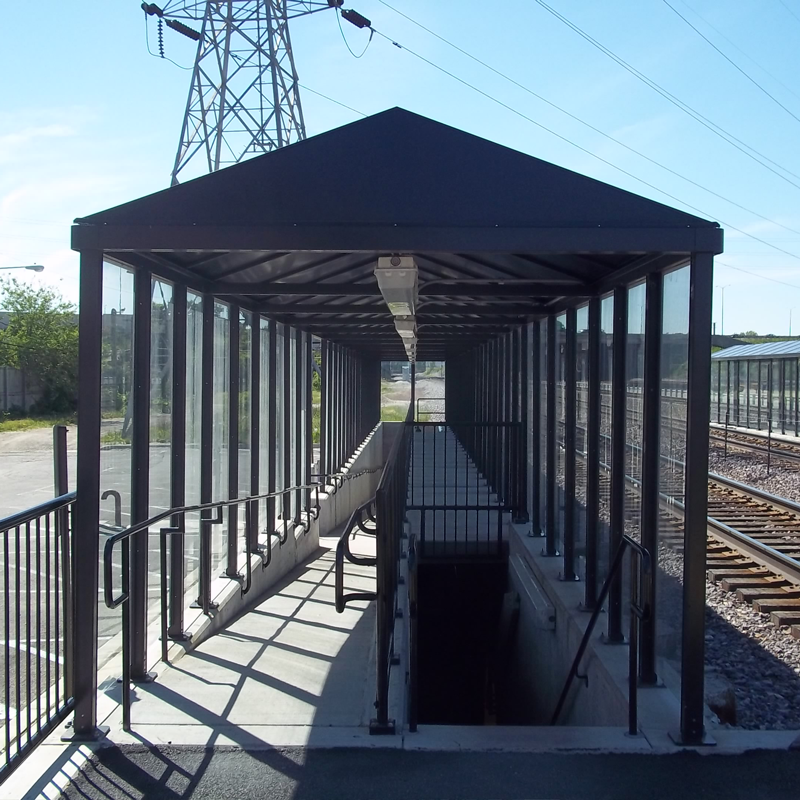 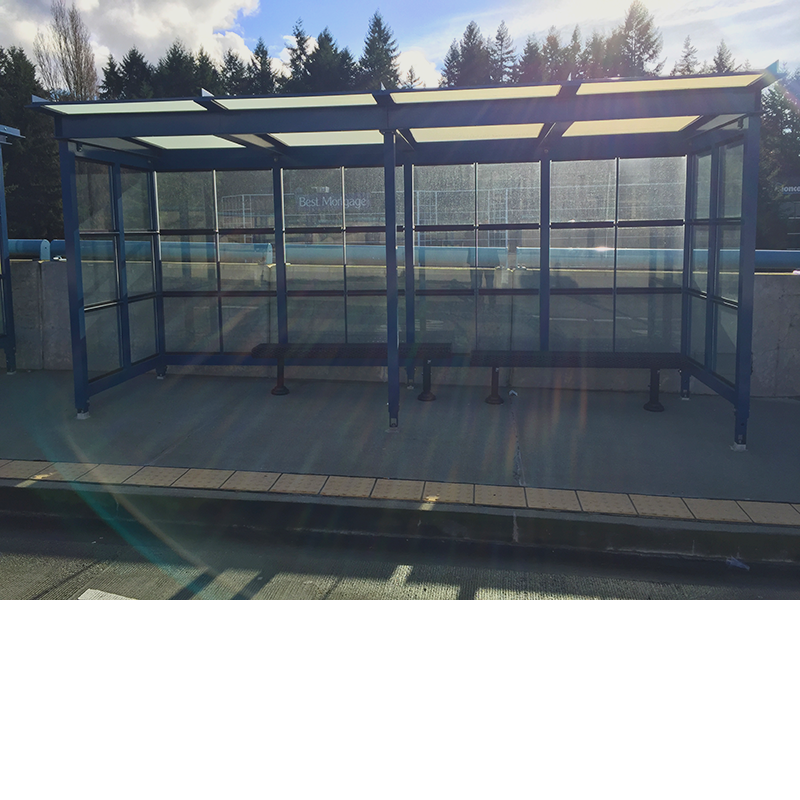 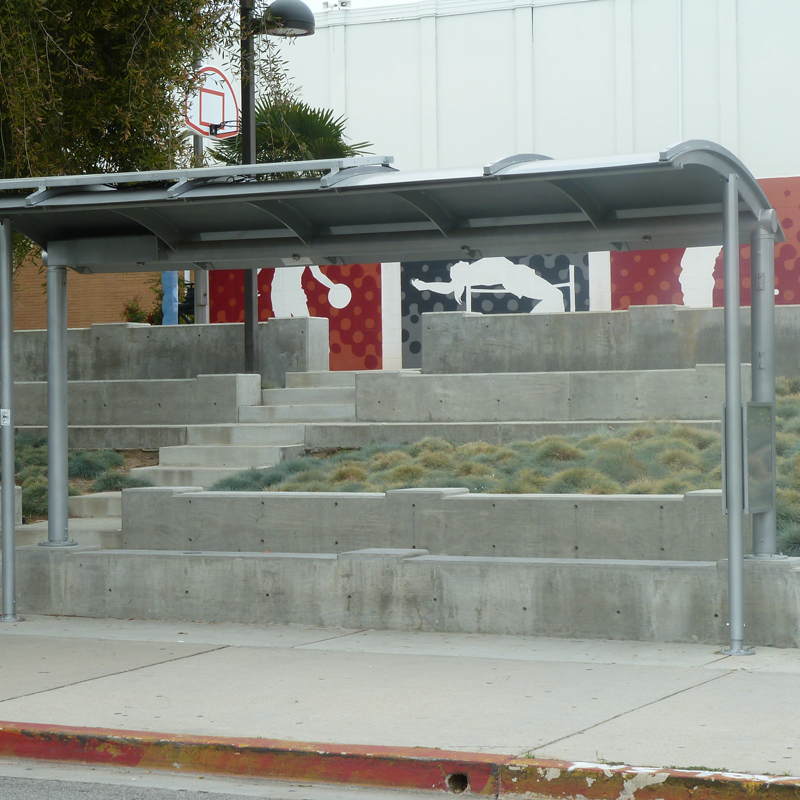 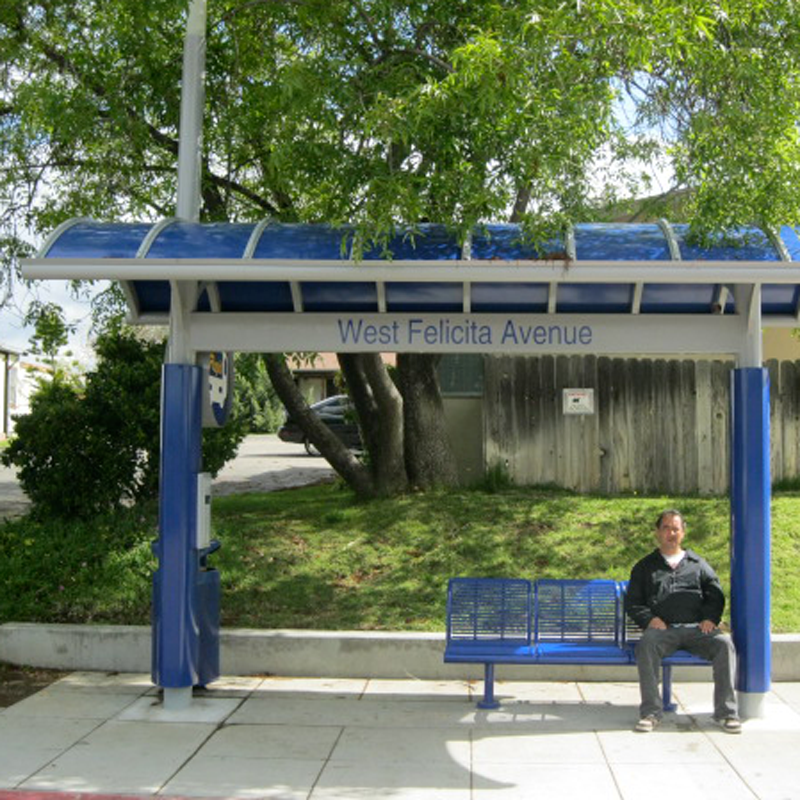 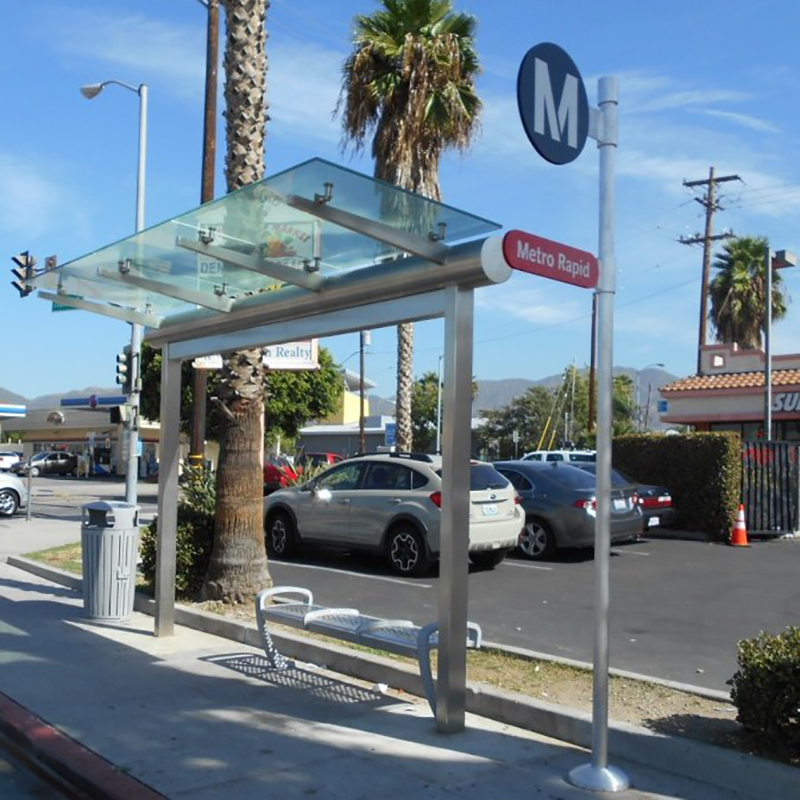 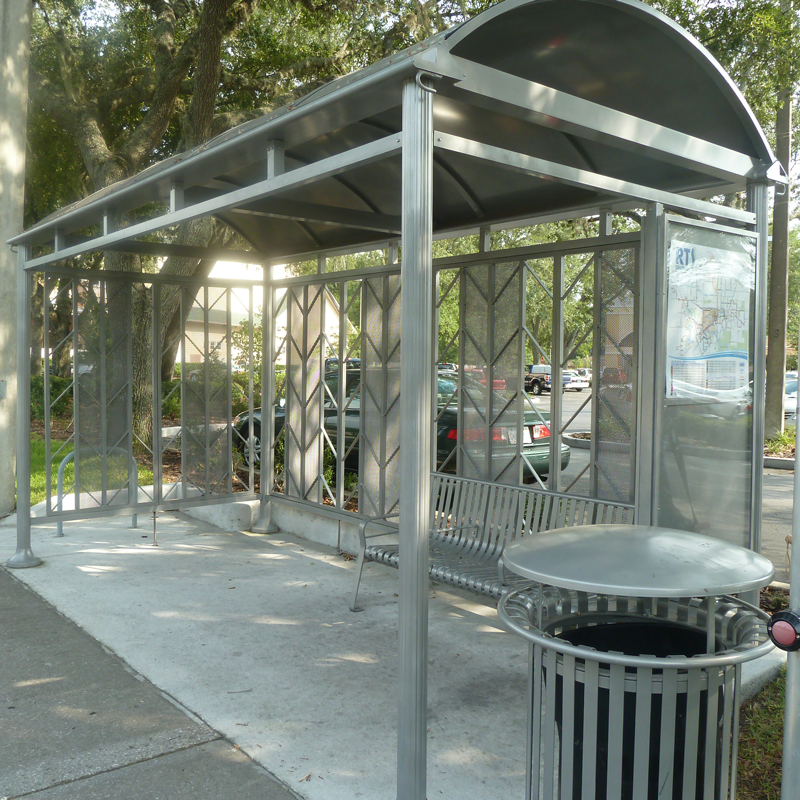 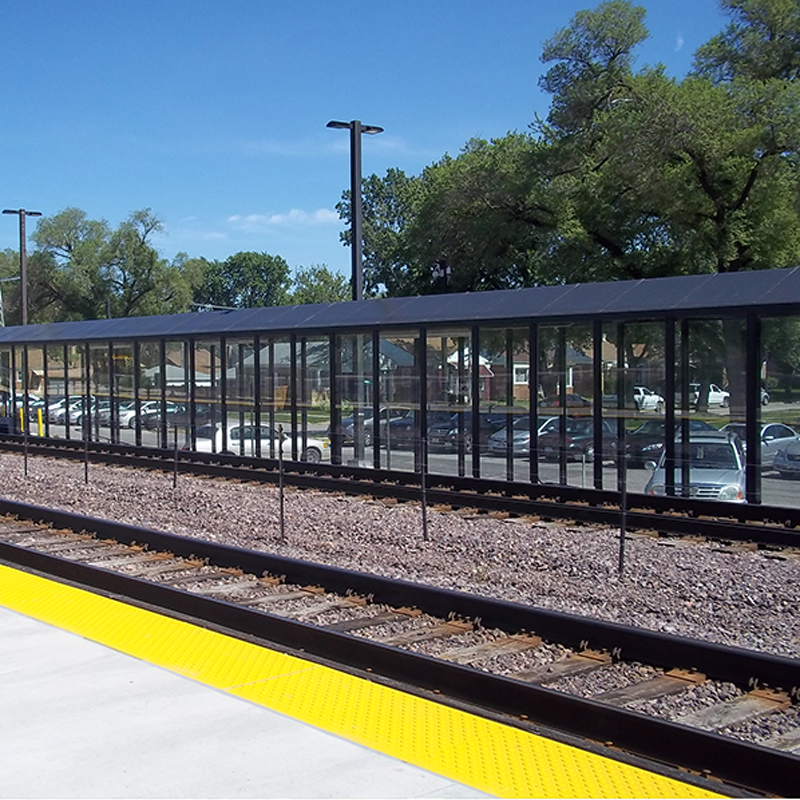 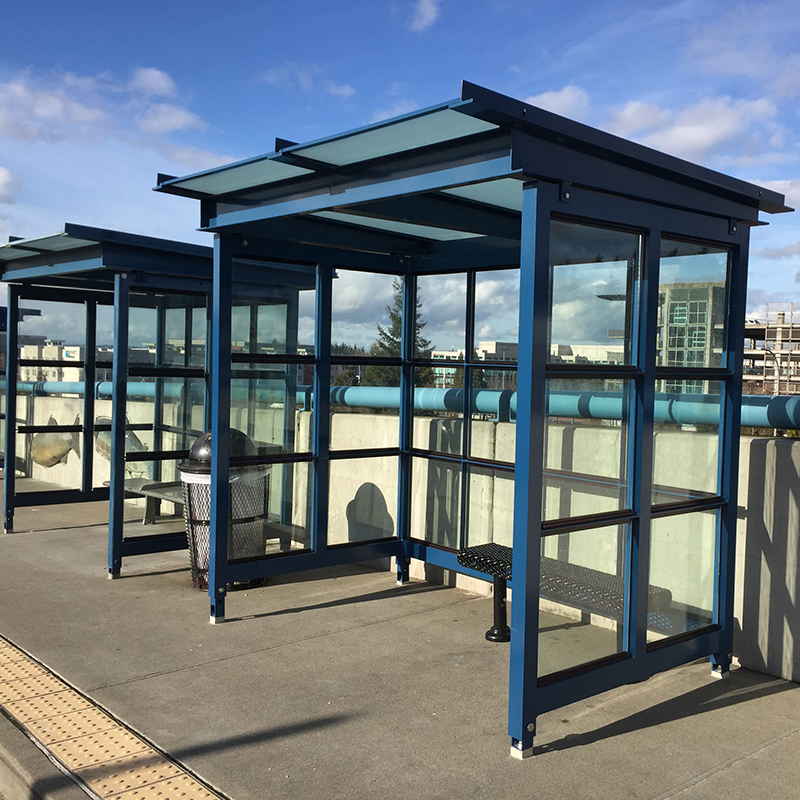 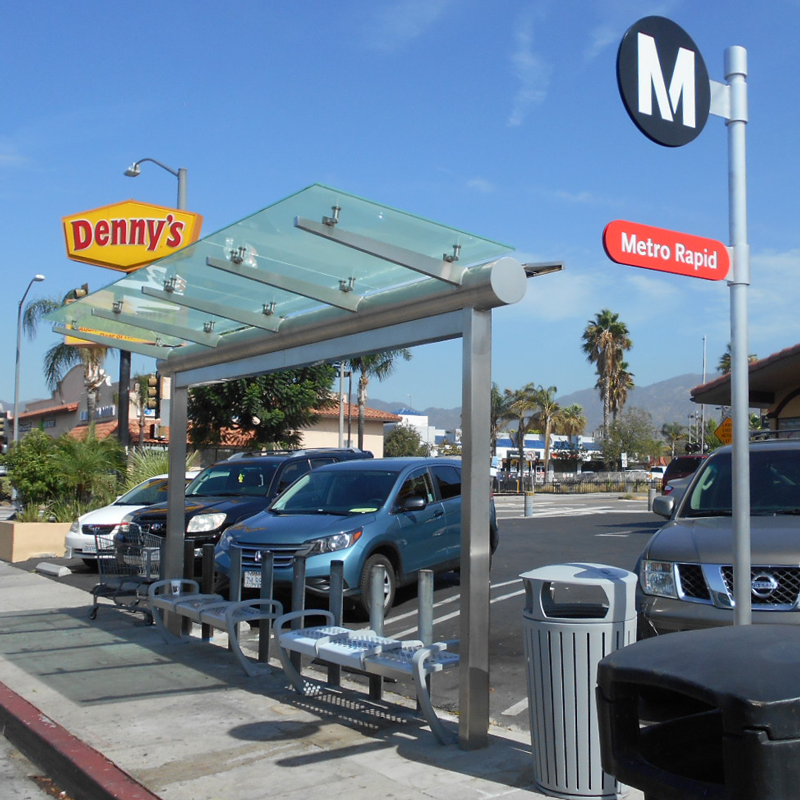 The Bus Rapid Transit/Rail shelter series is both beautiful and well built, bringing a combination of purpose-driven design and unsurpassed durability to your community that will last for decades. 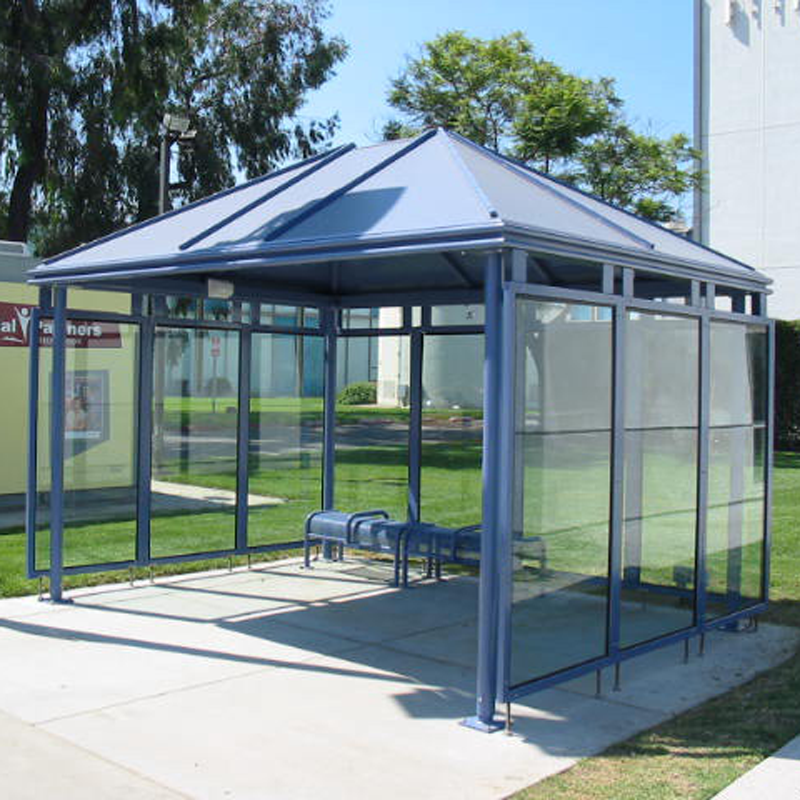 Cutting-edge looks and quality craftsmanship . 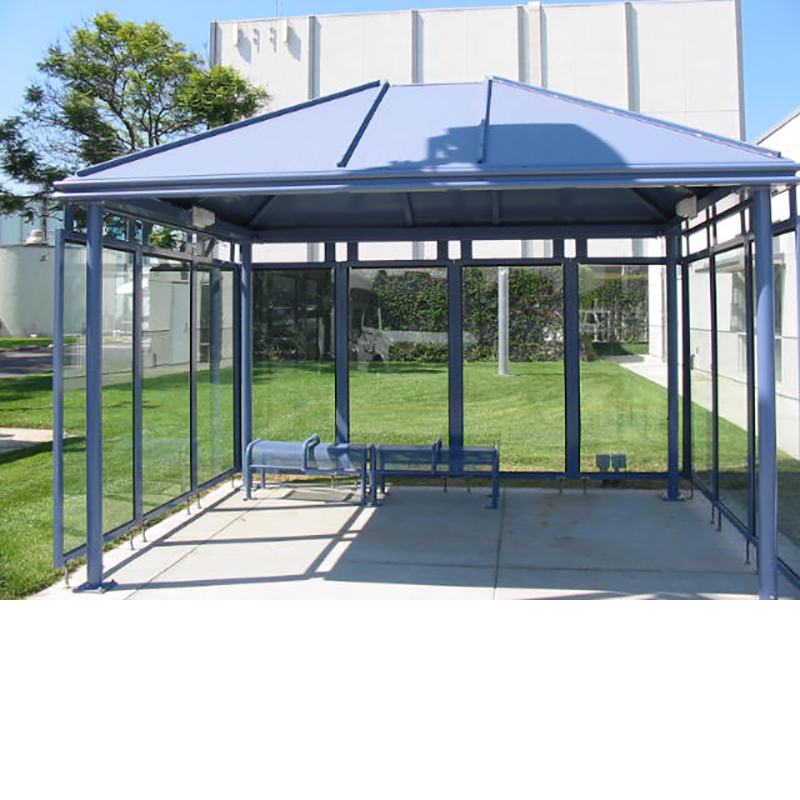 . . that’s the Tolar Difference. 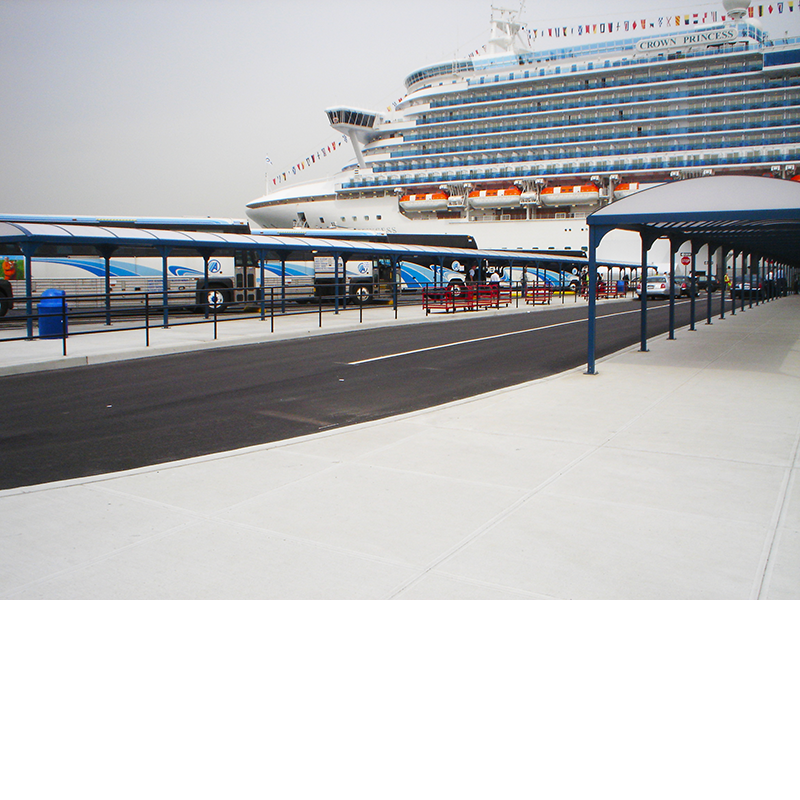 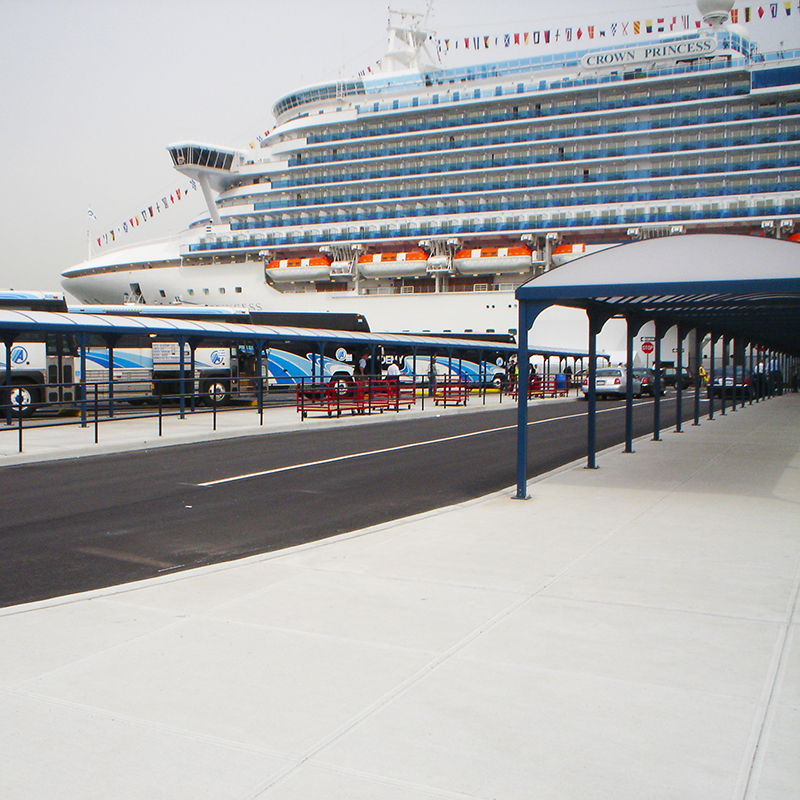 Concourse Brooklyn cruise ship terminal with Tolar Niagara Walkways. 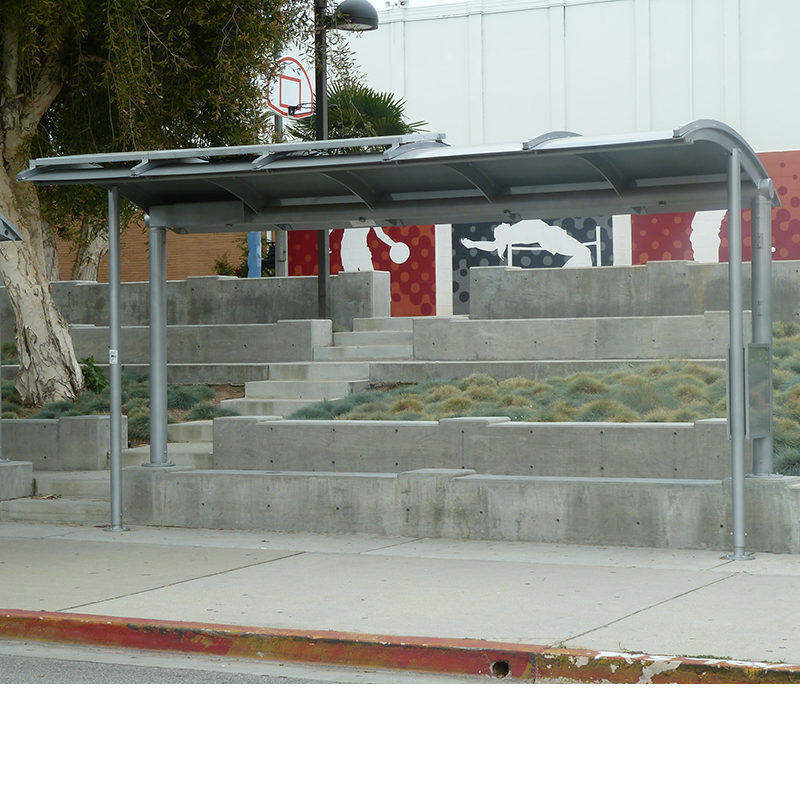 13’ x 10’ Sierra High Peak transfer center shelter with Gerard stone ground roof panels, perforated metal walls. 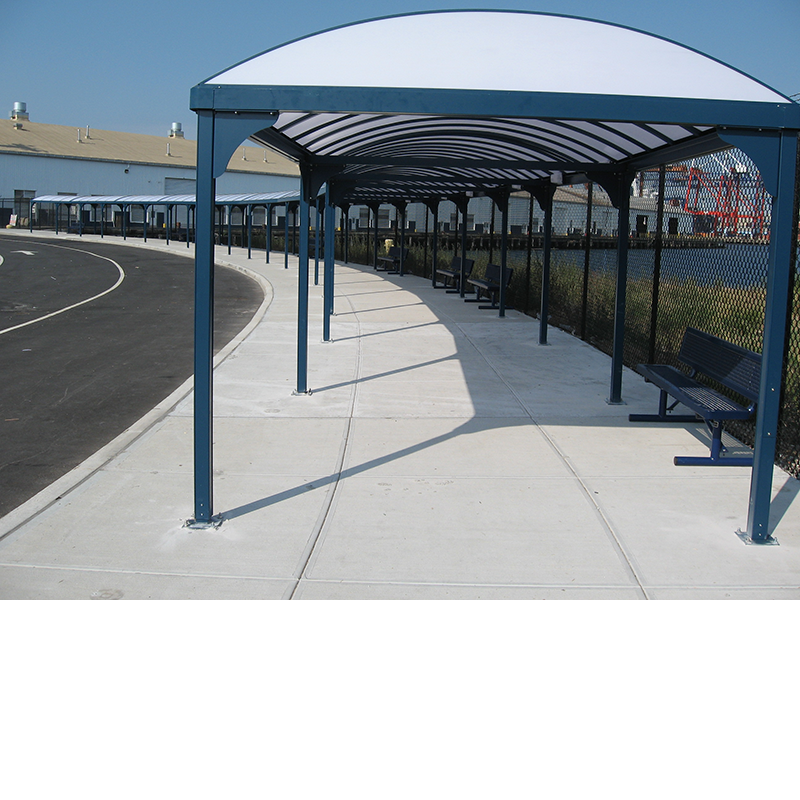 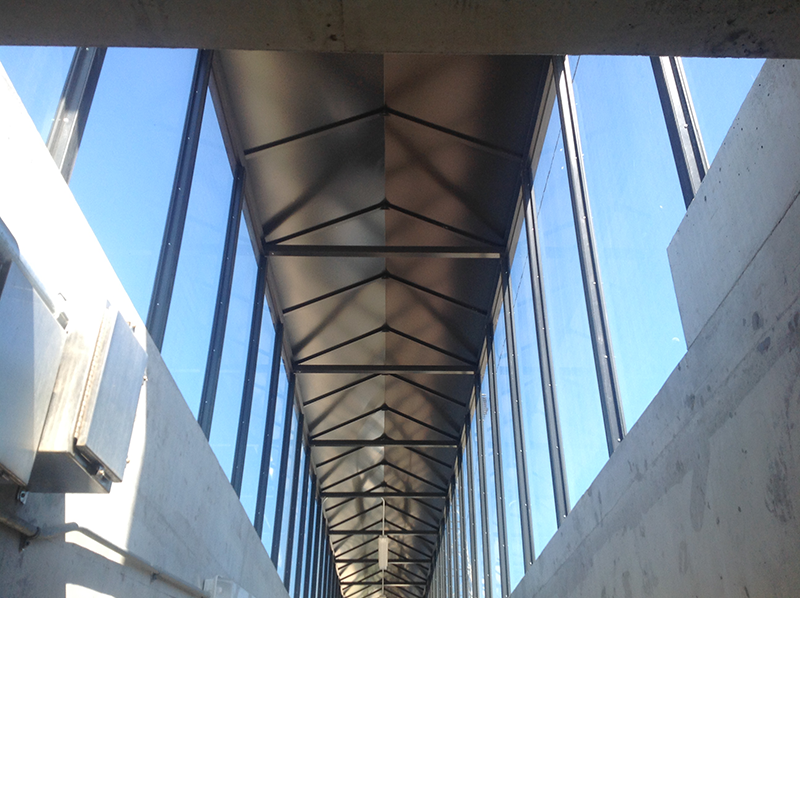 18’ Niagara Dome Roof High Capacity Transit Shelter with perforated metal walls and solar illumination. 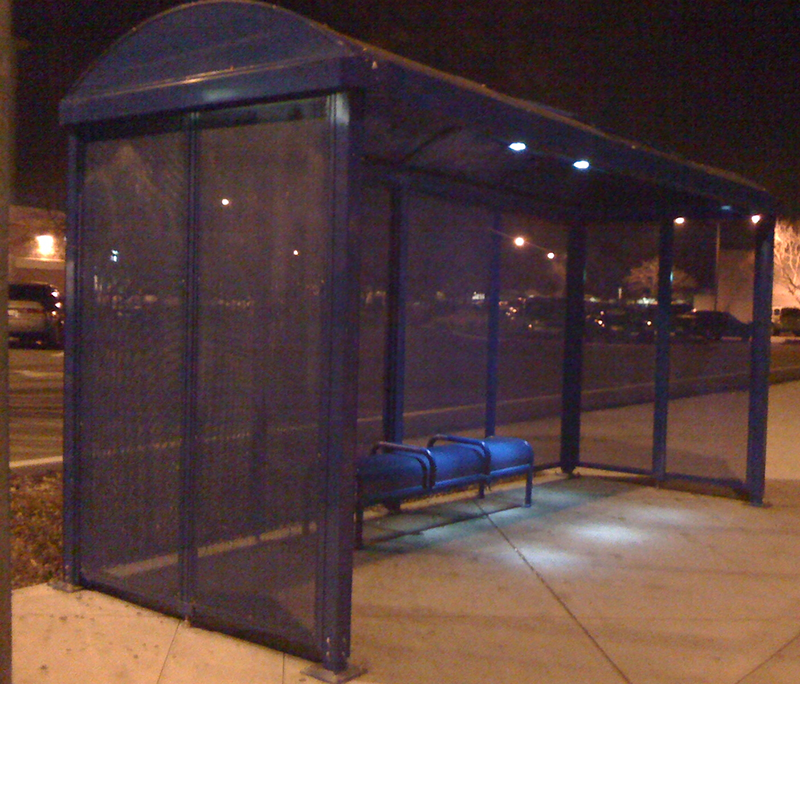 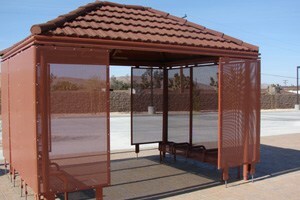 18’ Sierra Custom Hip High Capacity Transit Shelter. 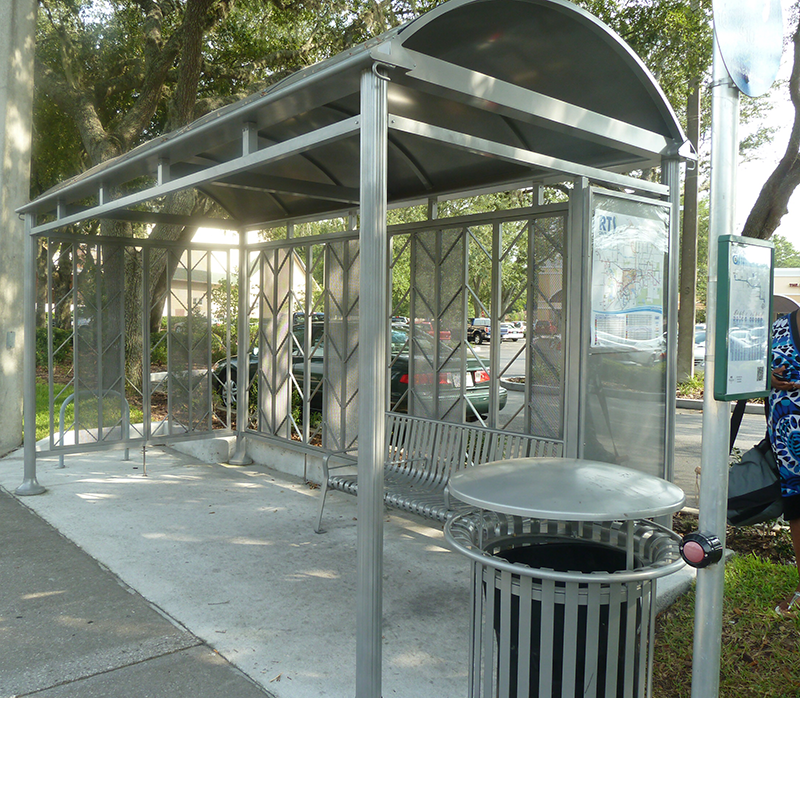 26’ Euro Shelter with Herringbone walls, integrated map case and matching steel strap bench and trash receptacle. 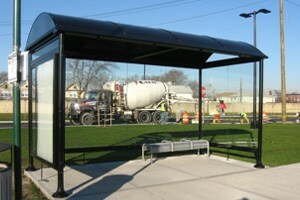 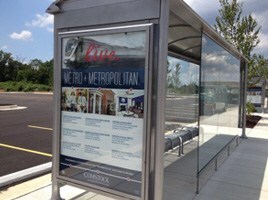 22’ x 6’ Euro High Capacity Transit Shelter with glass walls and media display kiosk. 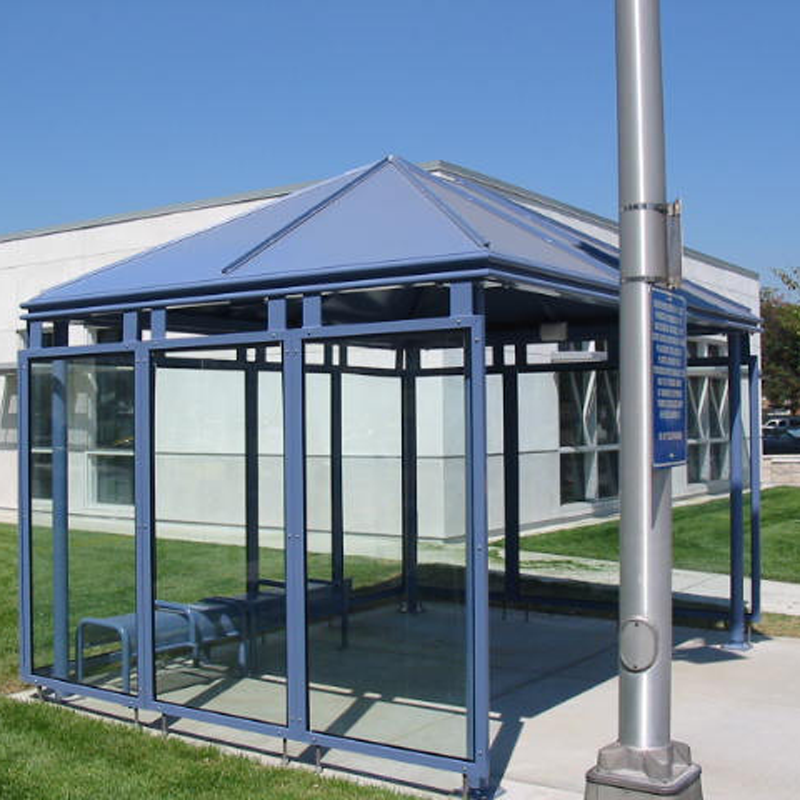 13’ x 10’ Sierra High Peak transfer center shelter with aluminum roof panels and glass walls. 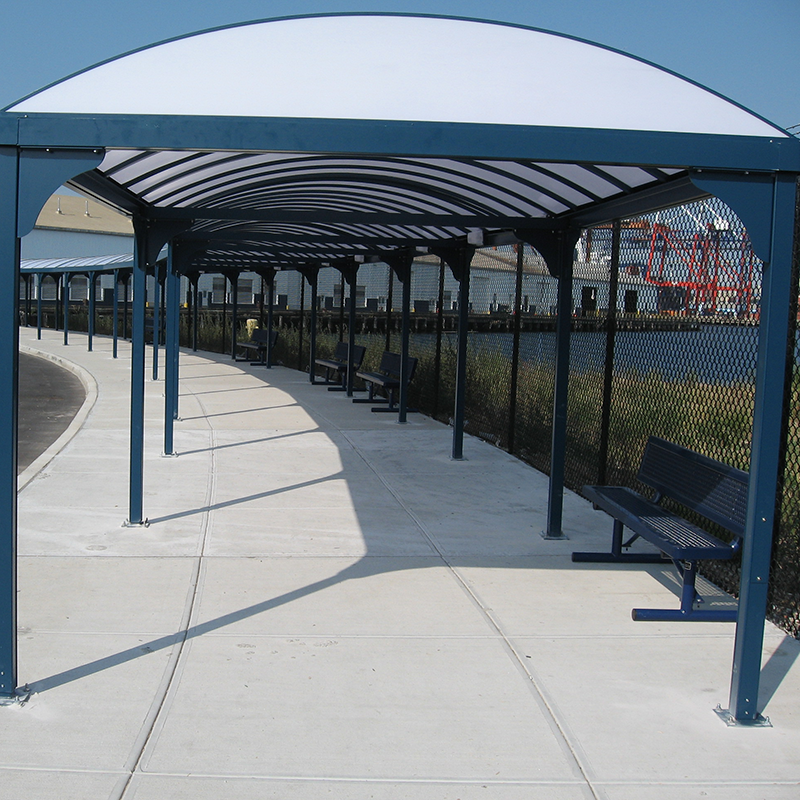 24’ Signature Sunset high capacity transit shelter with aluminum roof panels, glass walls, LED illumination. 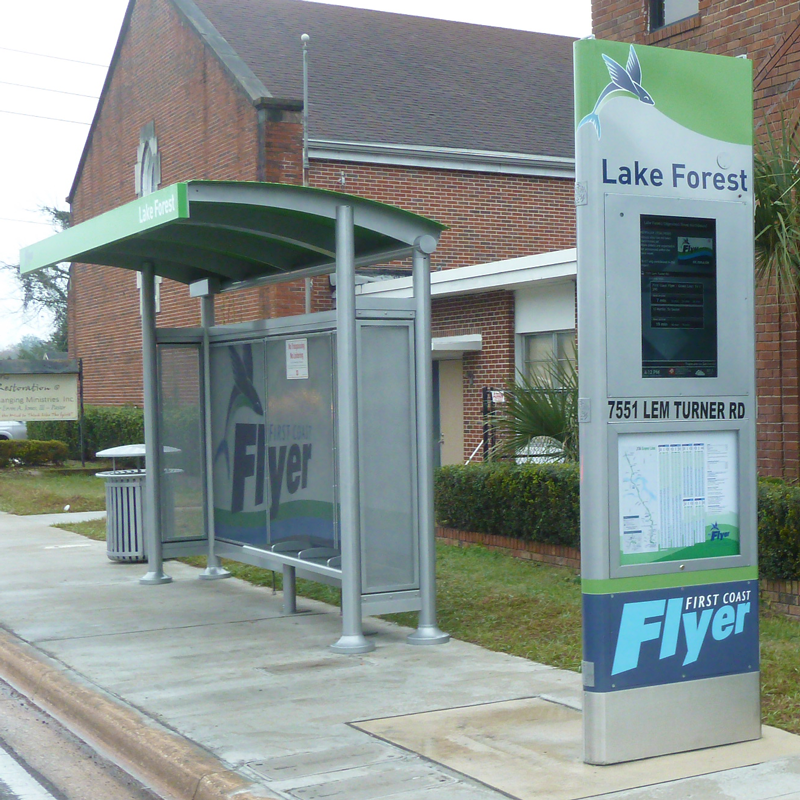 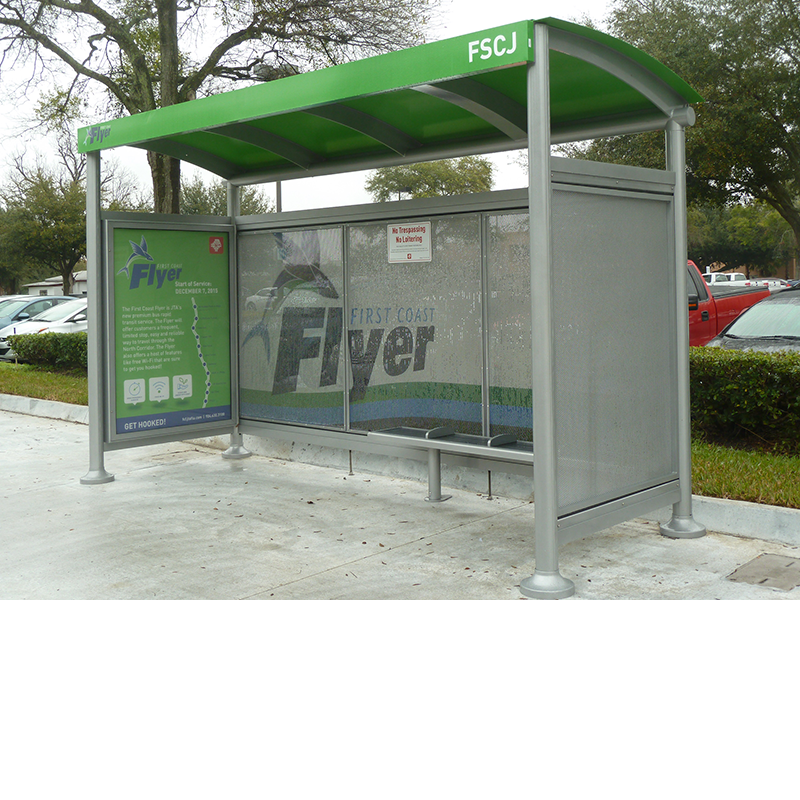 22’ Euro High Capacity transit shelter with two media display kiosks and front wind screen. 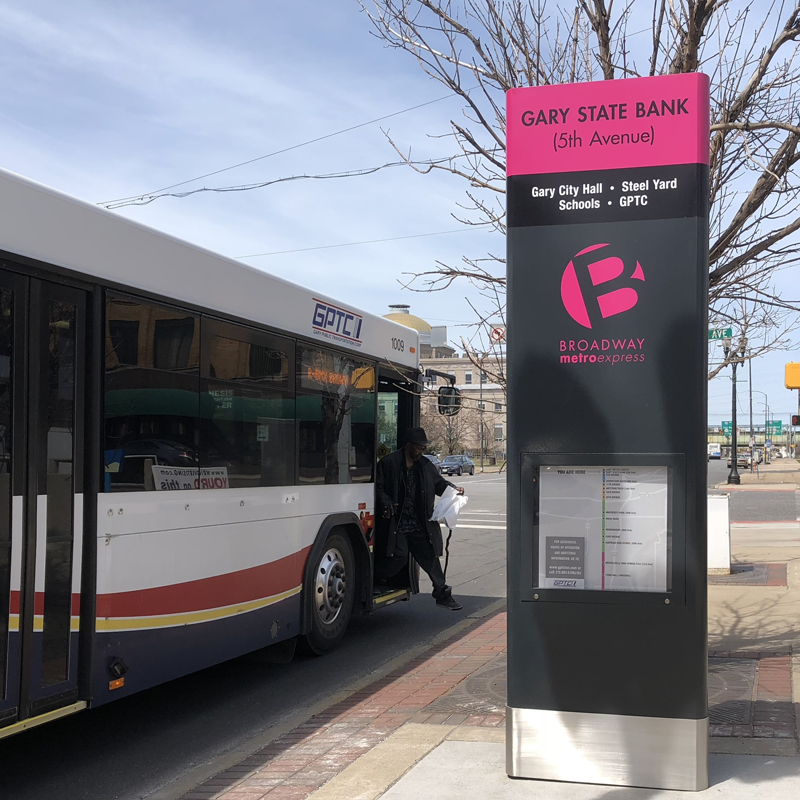 Working with closely with a local Gary, Indiana graphic designer, Tolar Manufacturing designed and fabricated 17 Bmx stops for Gary Public Transportation Corp. Each has an easily identifiable, brightly branded totem-style kiosk rising 10 feet from the ground. 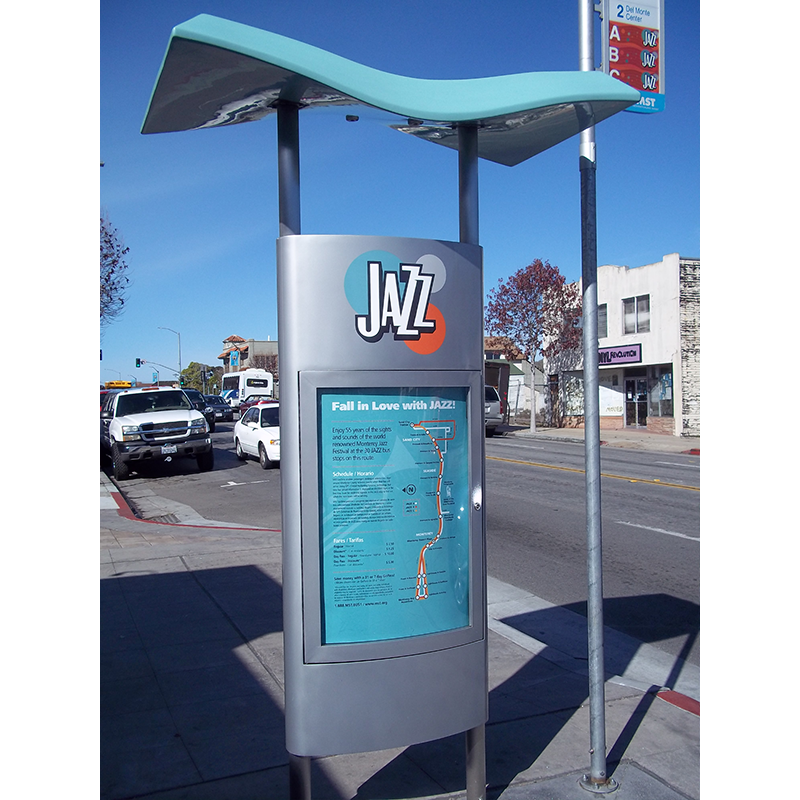 Each larger-than-life kiosk includes easy-to-read identifying locations at the top followed by major nearby destinations served, Bmx branding and a color-coded route map. 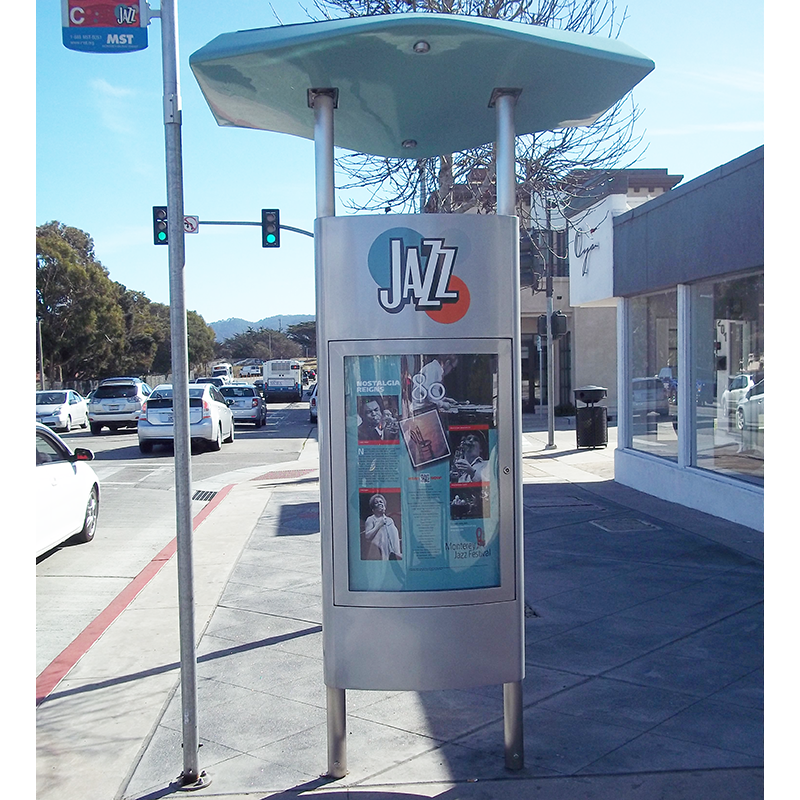 The color-coding coordinates with the actual stop color incorporated into the totem-signage. 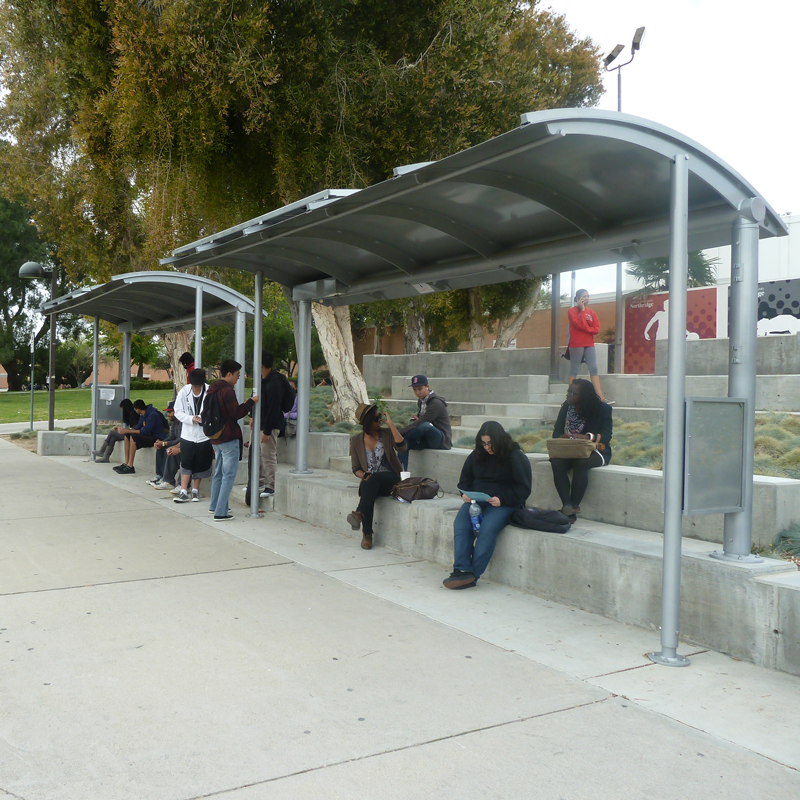 Importantly, each BMX stop includes a modern yet durable BRT-style shelter complete with weather protective arched roof, bench seating, and solar security lighting. 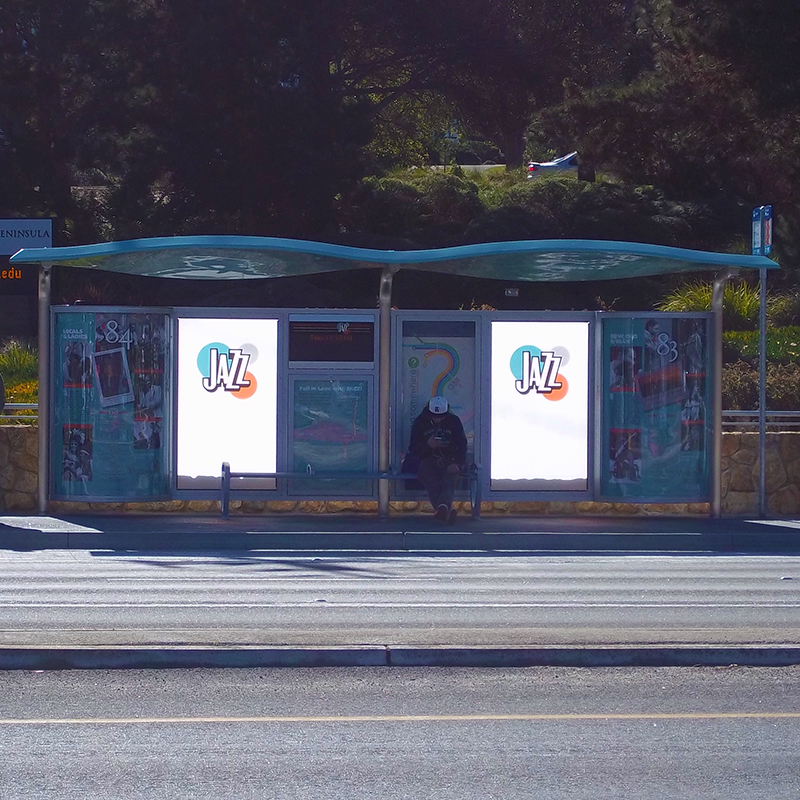 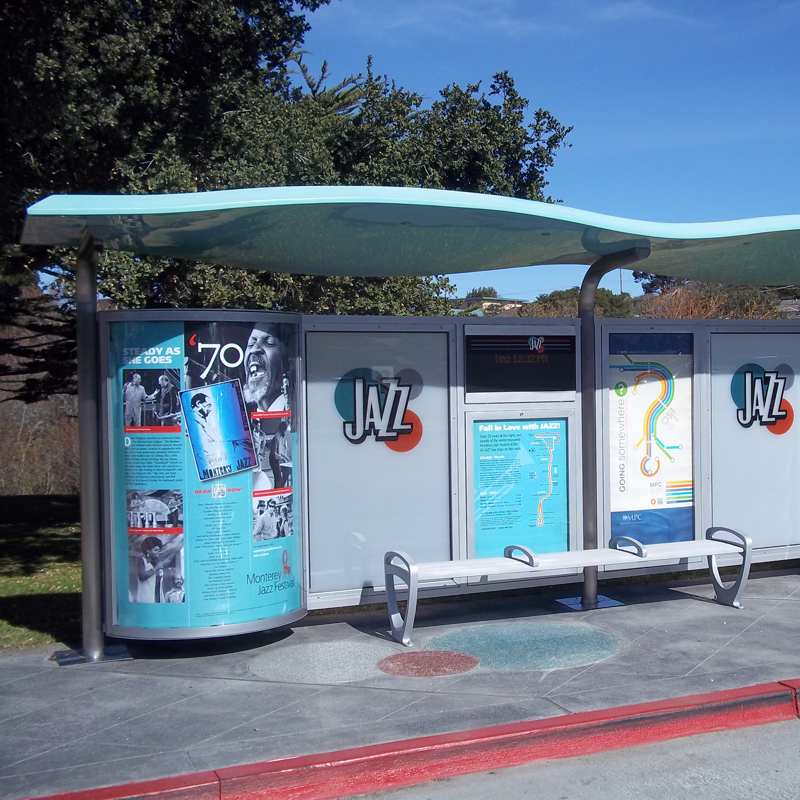 The shelters also incorporate local public art on the rear wall and revenue-generating advertisements are encased in a large, 22” X 25” double-sided information display. 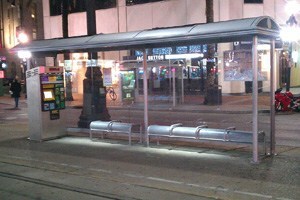 22’ Tolar Sierra Street Car Shelter in New Orleans (LA) with aluminum roof panels, glass walls, integrated map case and solar LED illumination. 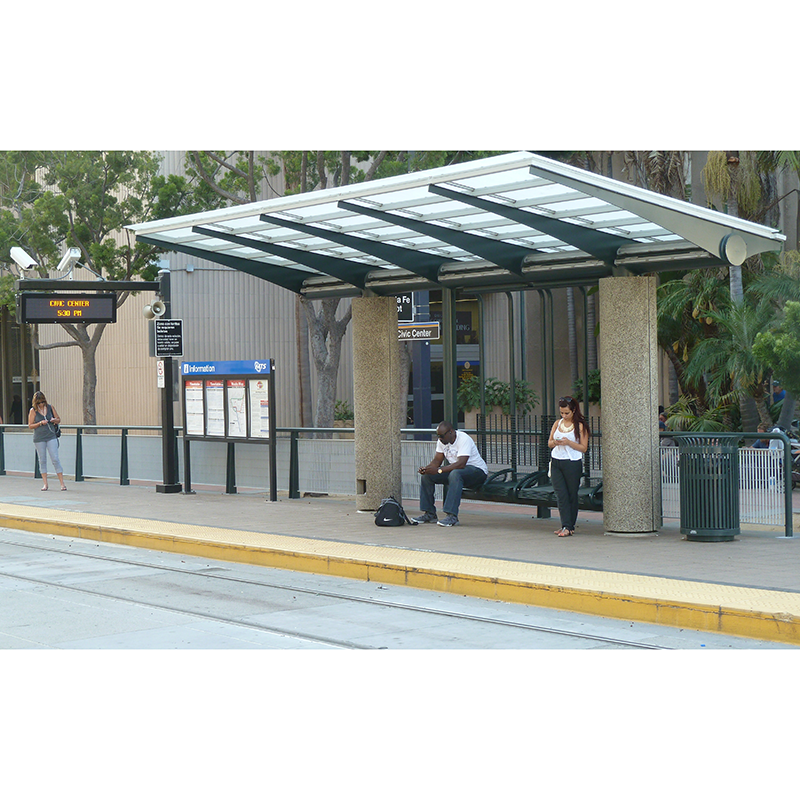 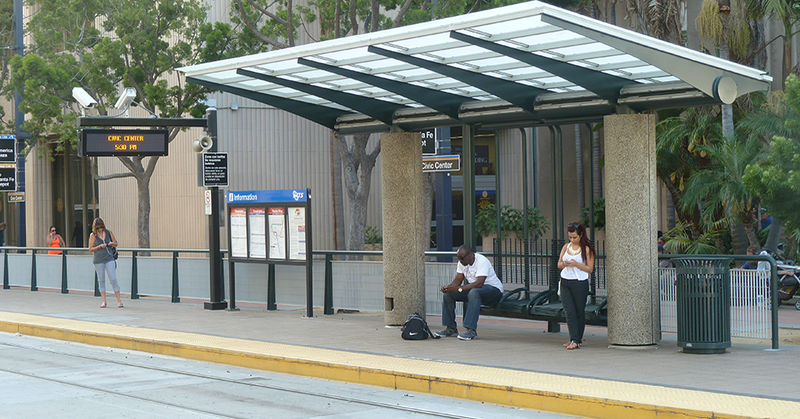 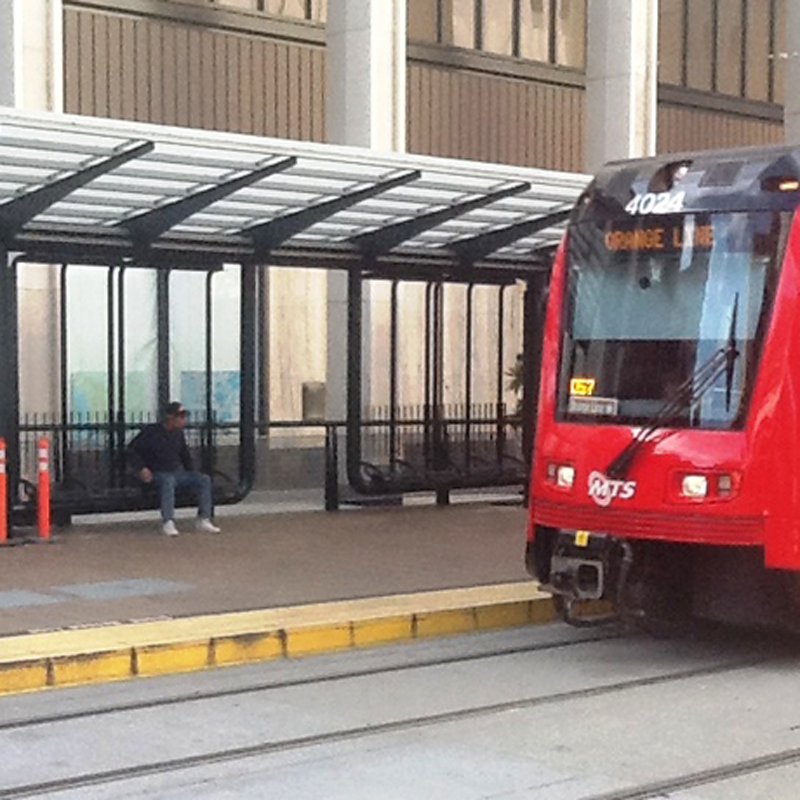 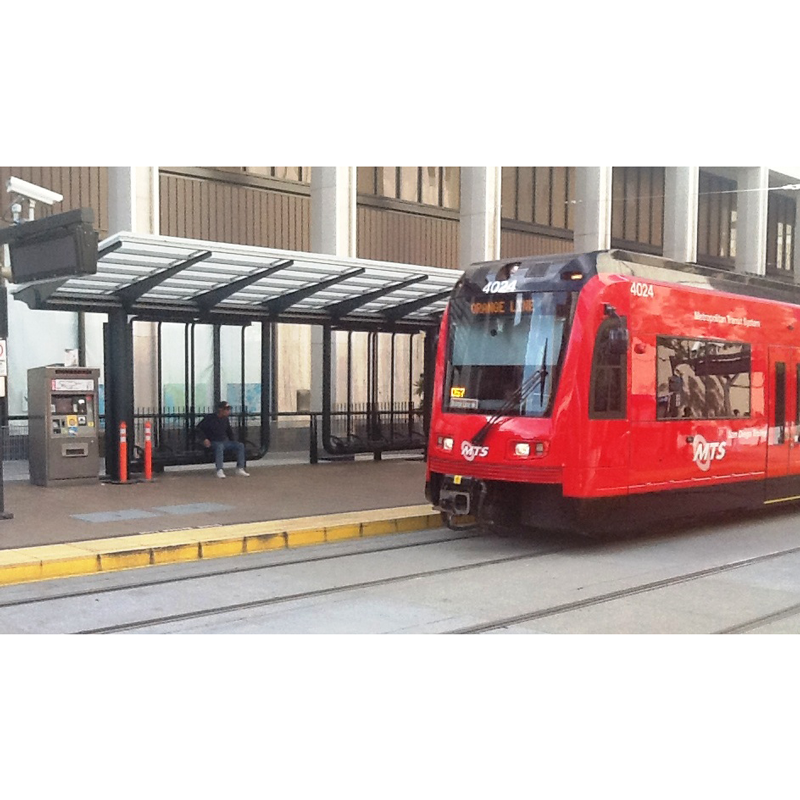 Tolar Custom Trolley Shelters in San Diego (CA) featuring all steel construction, custom roof panels, custom lighting, concrete post cladding. 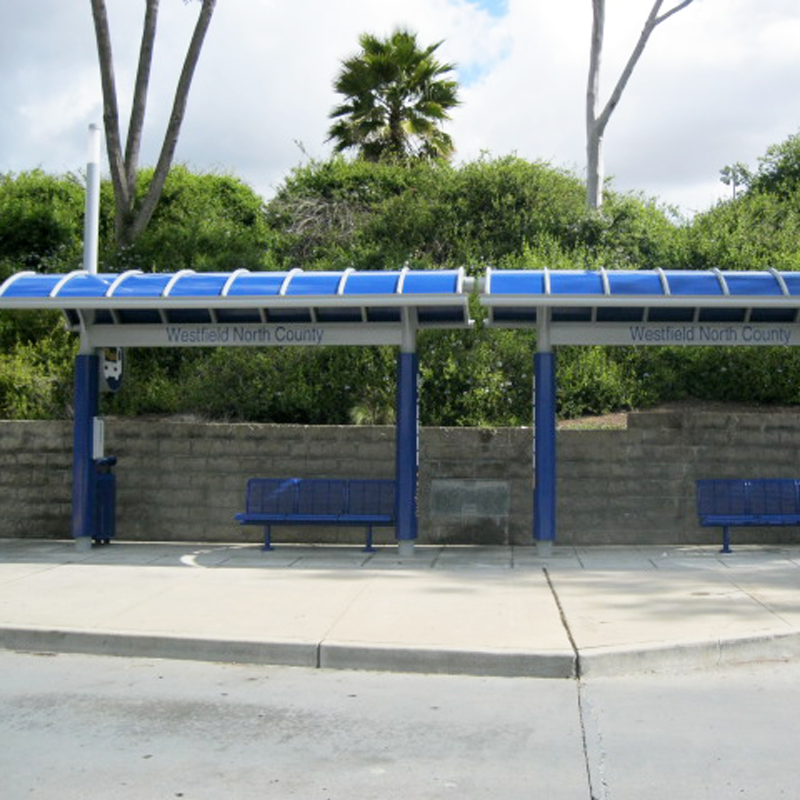 32’ Tolar Signature BRT Shelter for Escondido (CA) with custom columns and a signaling beacon. 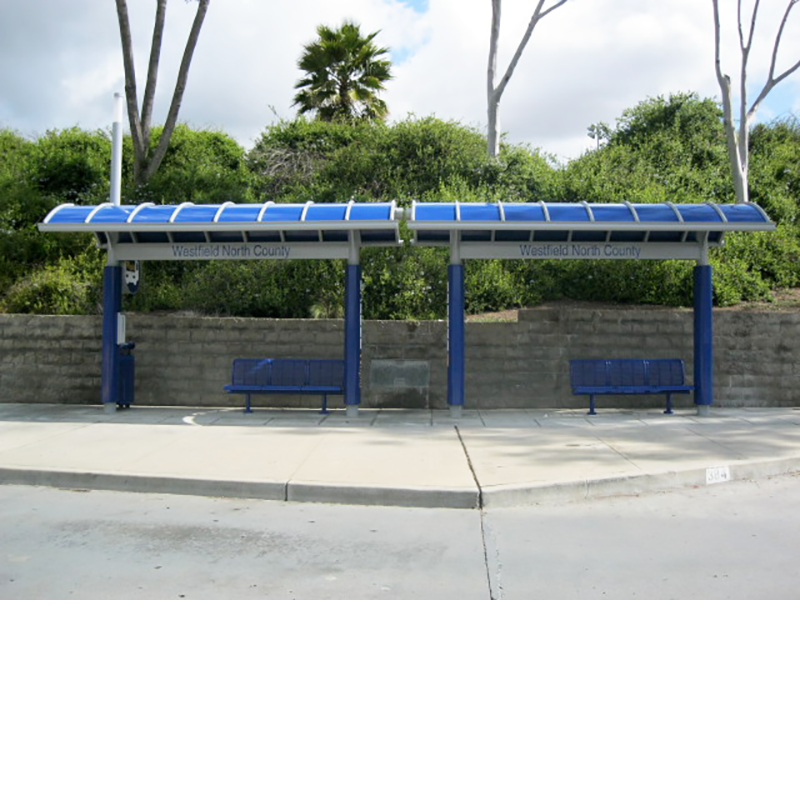 16’ Tolar Signature BRT Shelter for Escondido (CA) with custom columns and a signaling beacon. 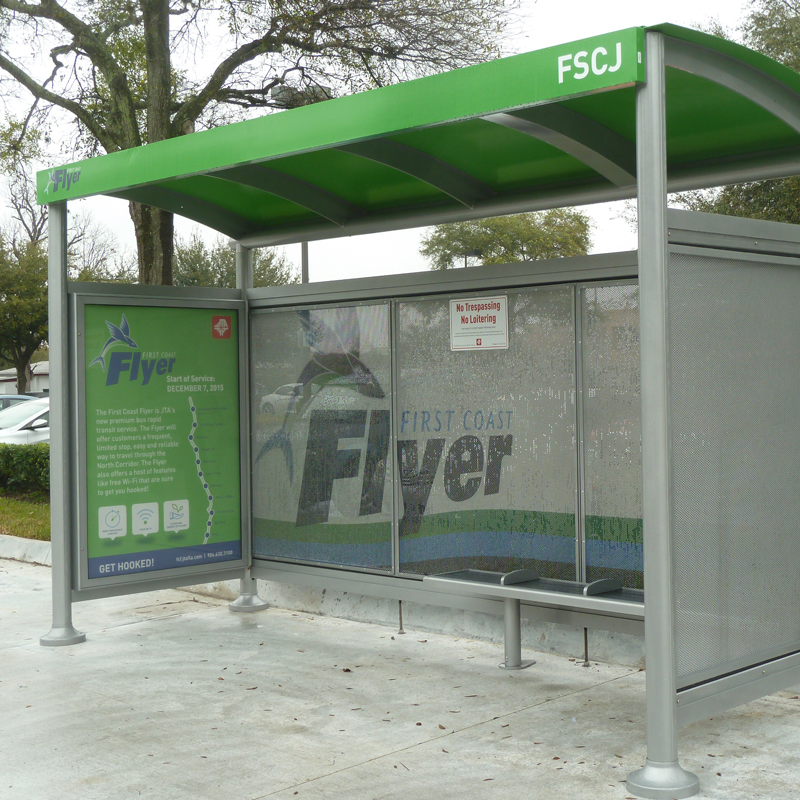 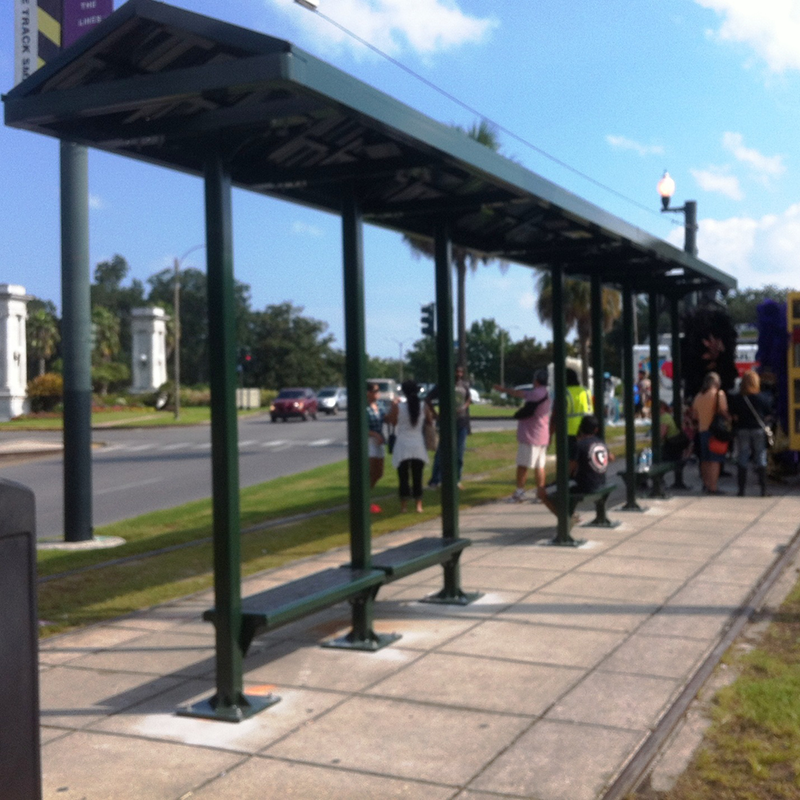 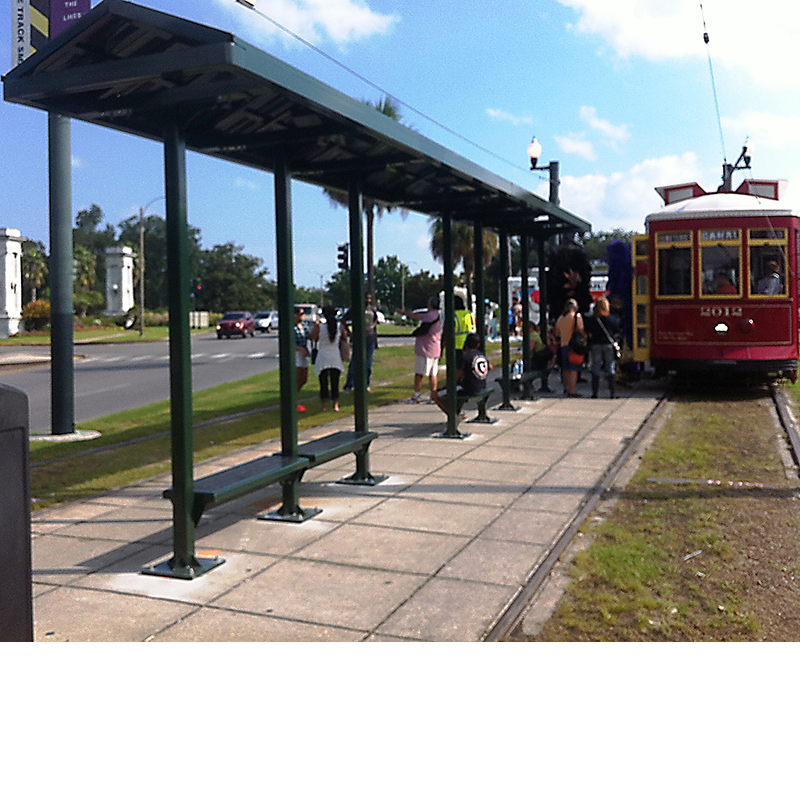 26’ Tolar Signature Custom Street Car Shelter in New Orleans (LA) featuring a high peak roof and integrated recycle slat benches. 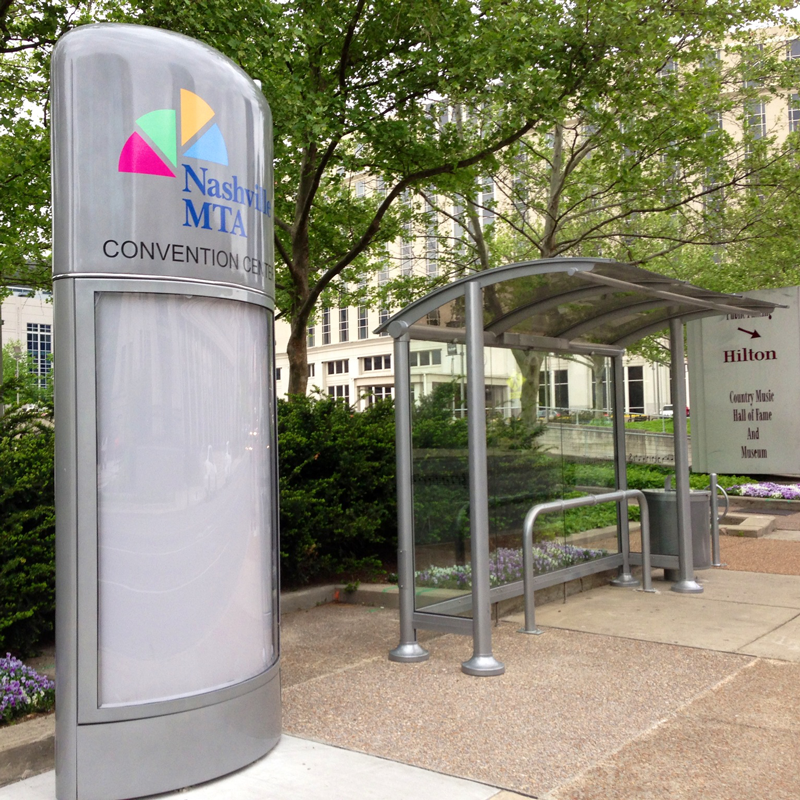 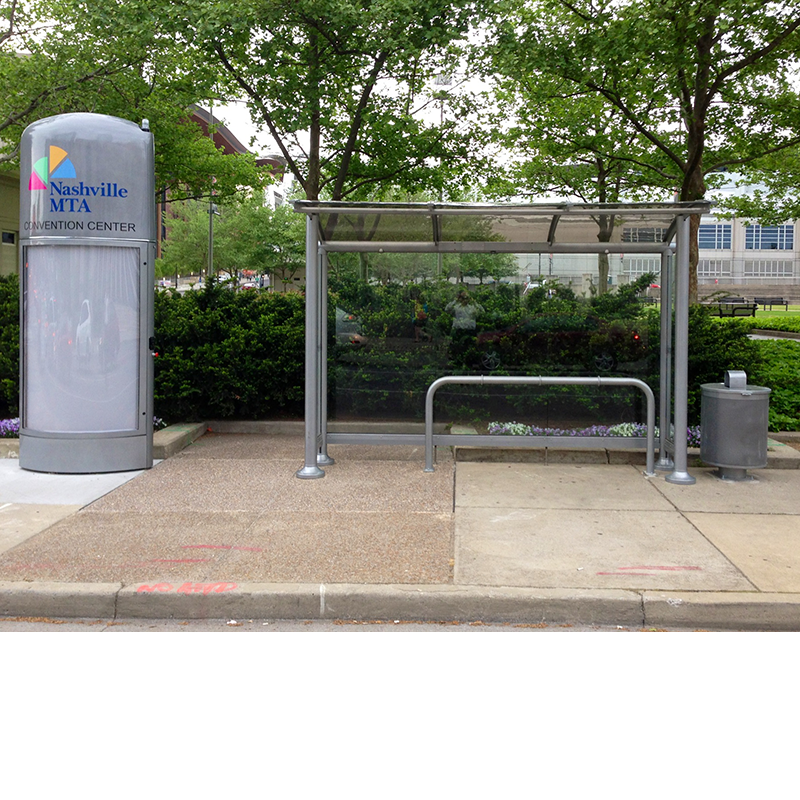 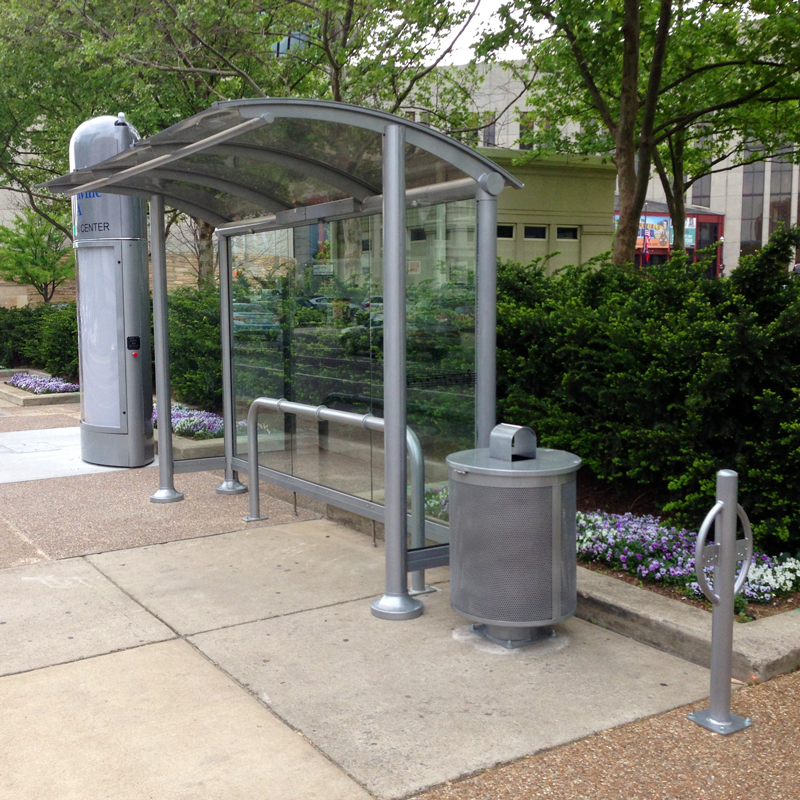 Tolar Signature Radius Roof BRT shelter for Nashville (TN) MTA featuring custom Music City glass, lean rail, bike loops, trash receptacle and fiberglass, backlit information kiosk. 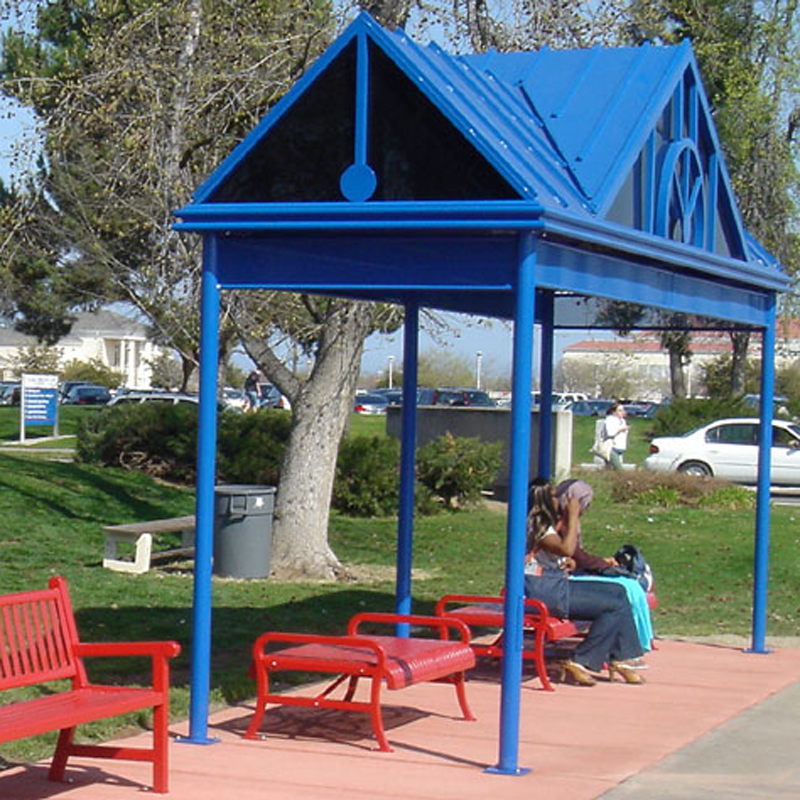 Tolar Signature Gull-Wing Shelter for SJRTD in Stockton, CA. 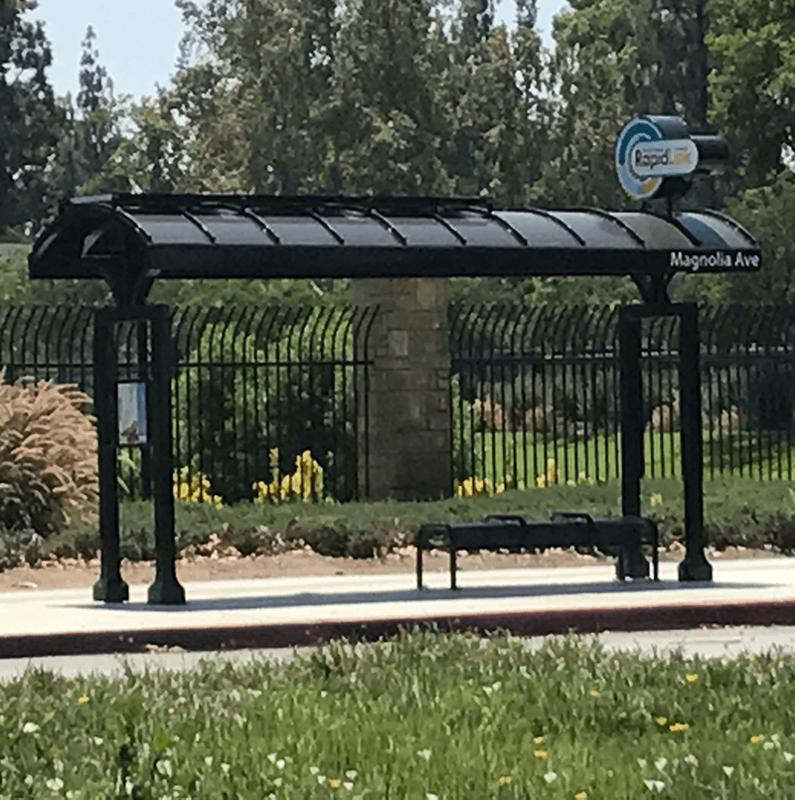 12’ Tolar Signature BRT Solution for Tri-Valley Rapid in Livermore, CA featuring custom agency branded glass, real time information and integrated map case. 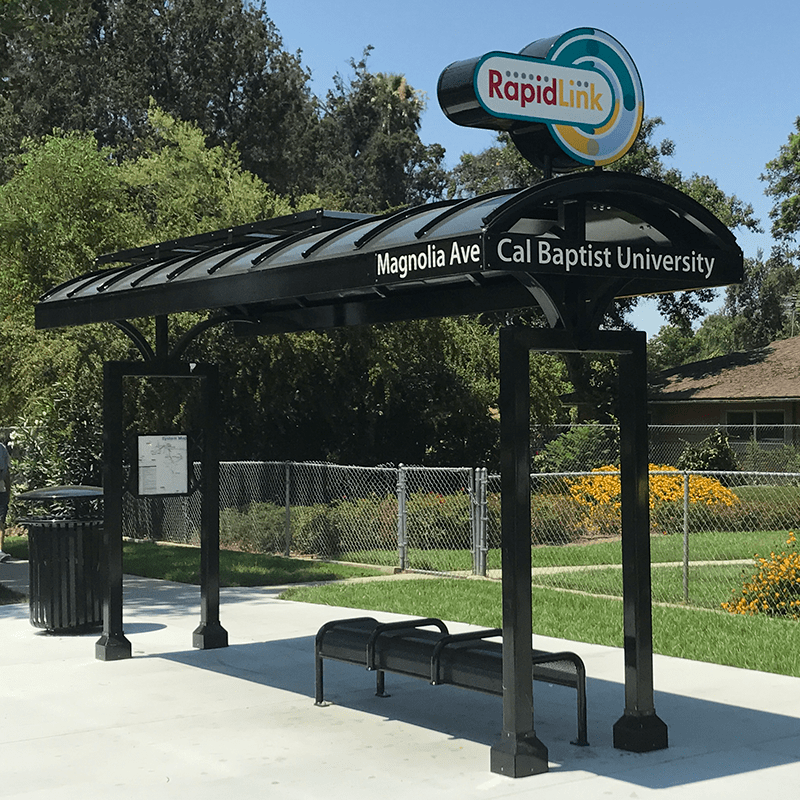 24’ Tolar Signature BRT Solution for Tri-Valley Rapid in Livermore, CA featuring custom agency branded glass, real time information and integrated map case. 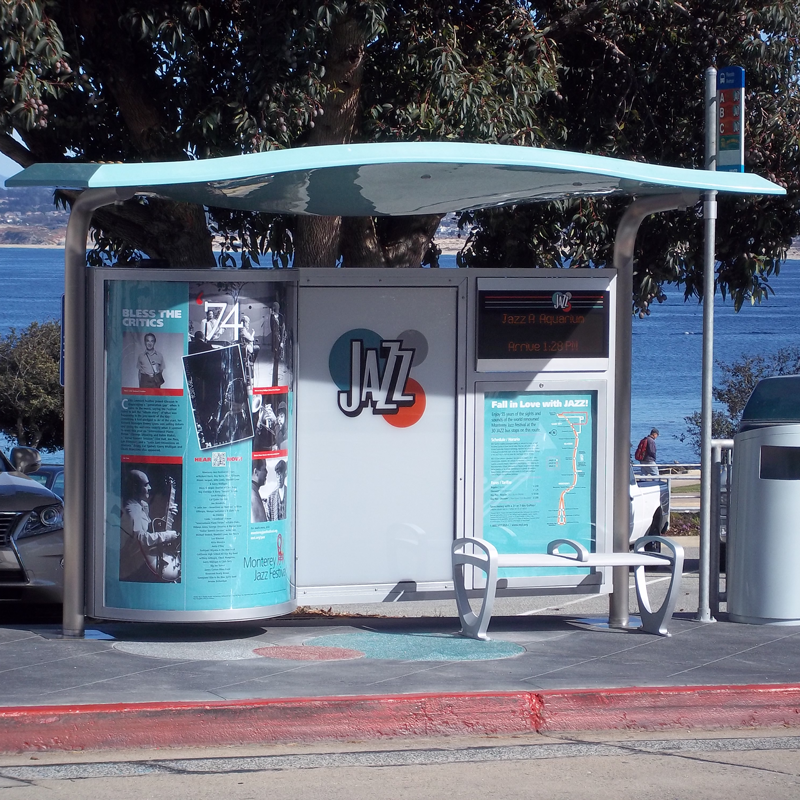 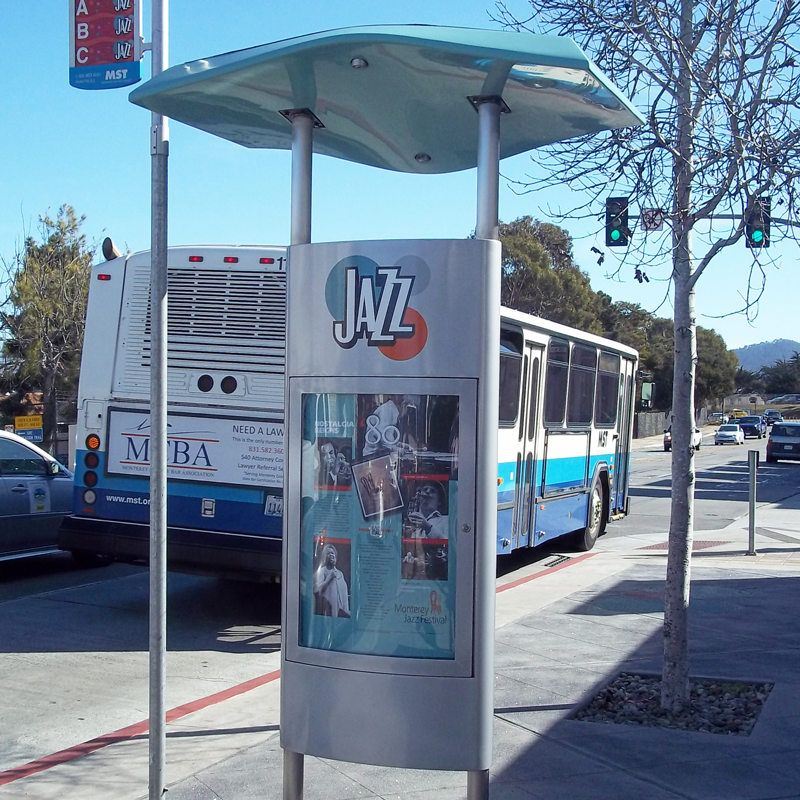 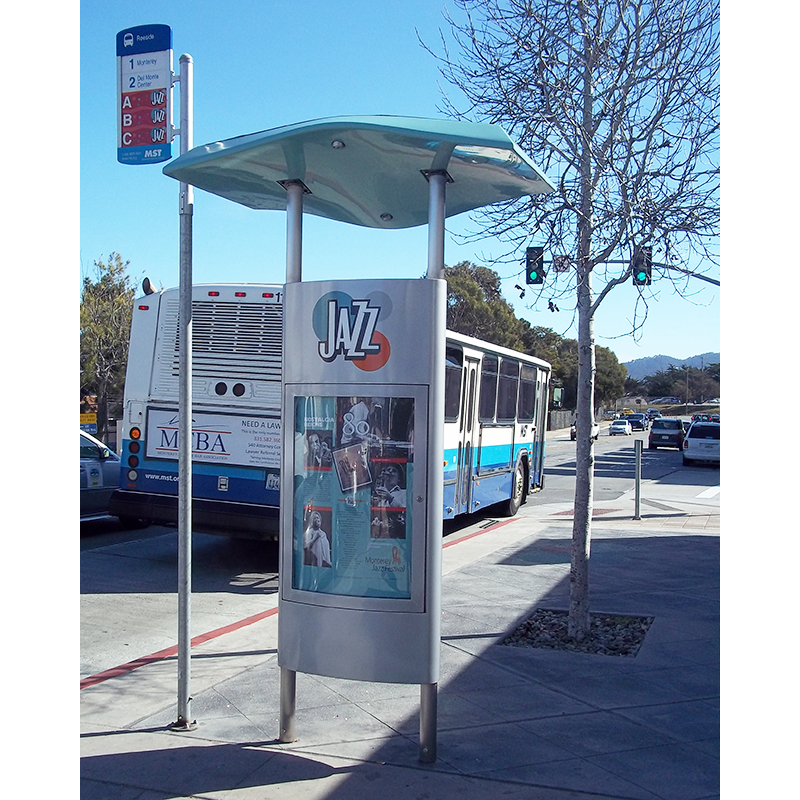 Tolar Signature BRT Display Totem Solution for Monterey Salinas Transit’s JAZZ BRT Featuring a fiberglass roof with stainless steel supports, integrated map display, solar illumination and bull nose display kiosk. 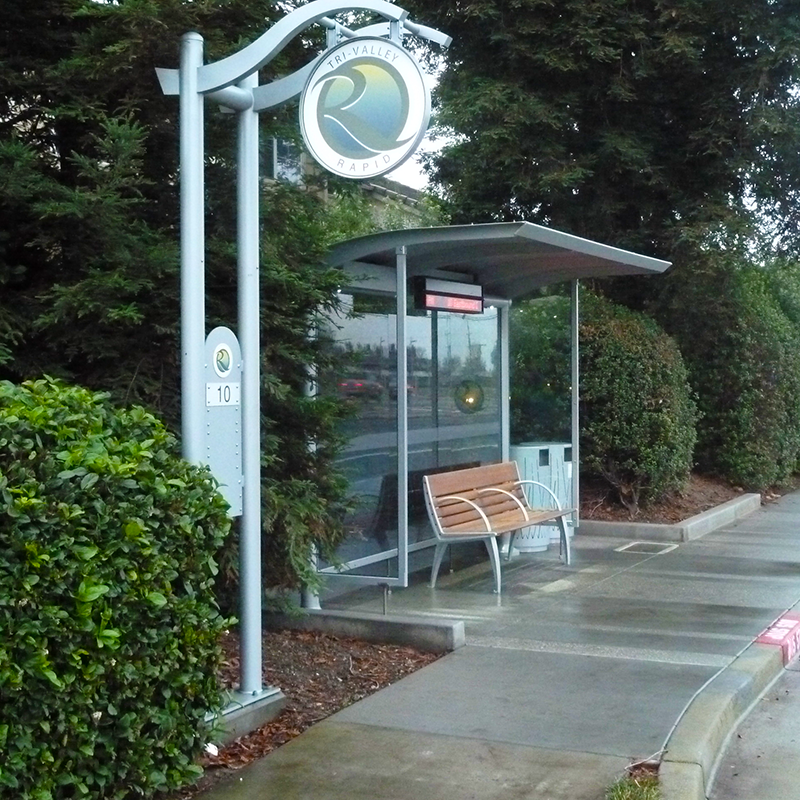 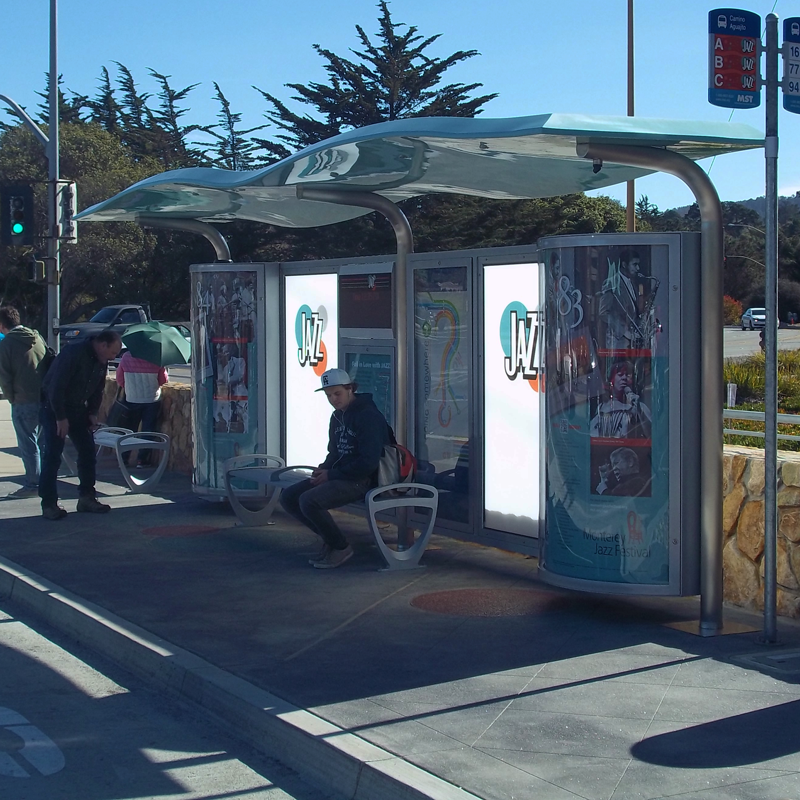 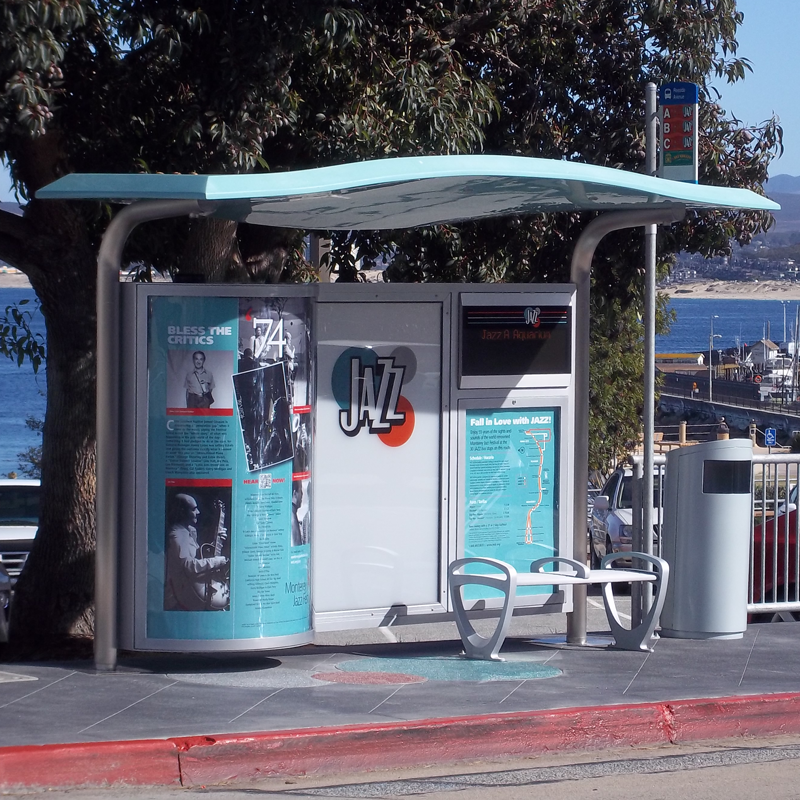 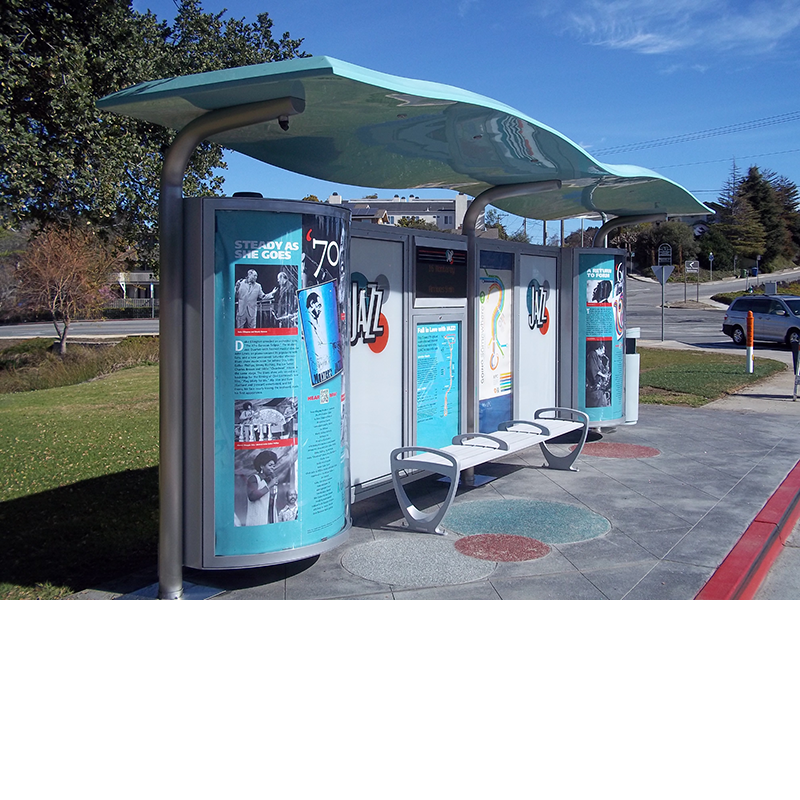 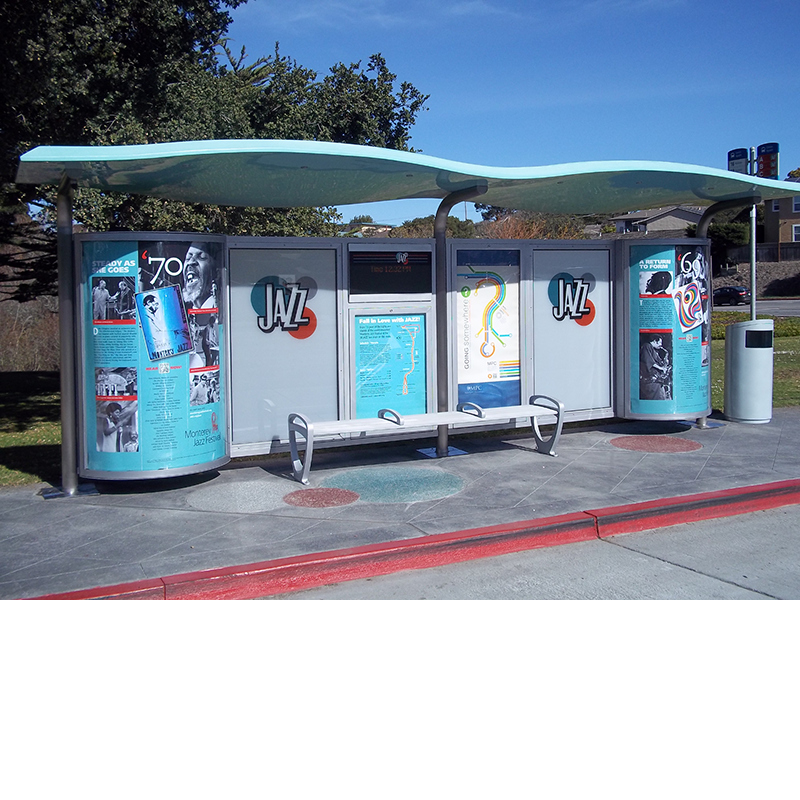 11’ Tolar Signature BRT Transit Shelter Solution for Monterey Salinas Transit’s JAZZ BRT Featuring a fiberglass roof with stainless steel supports, integrated map display, custom glass and bull nose display kiosk. 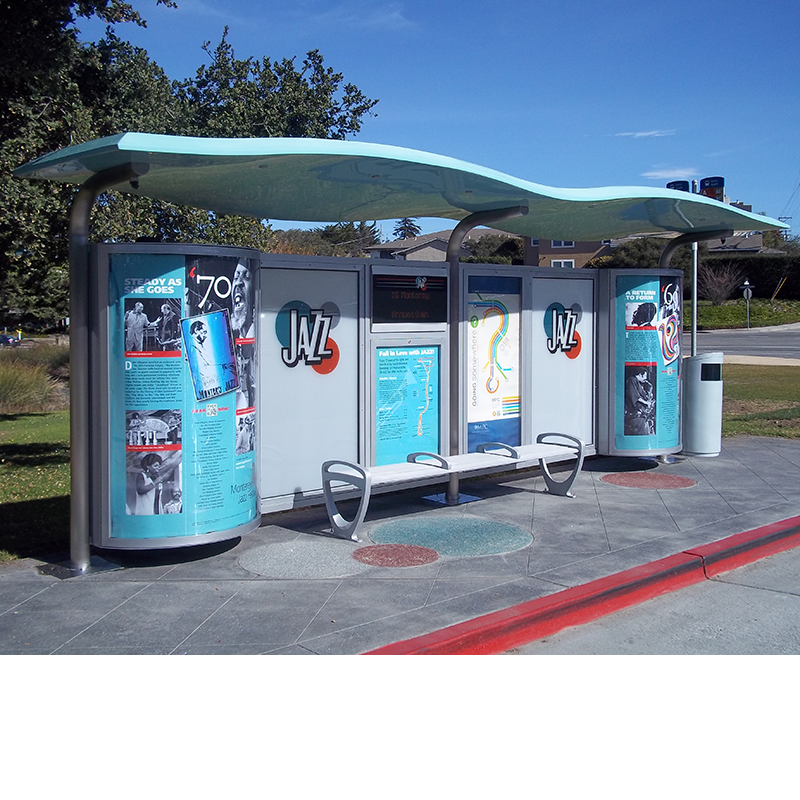 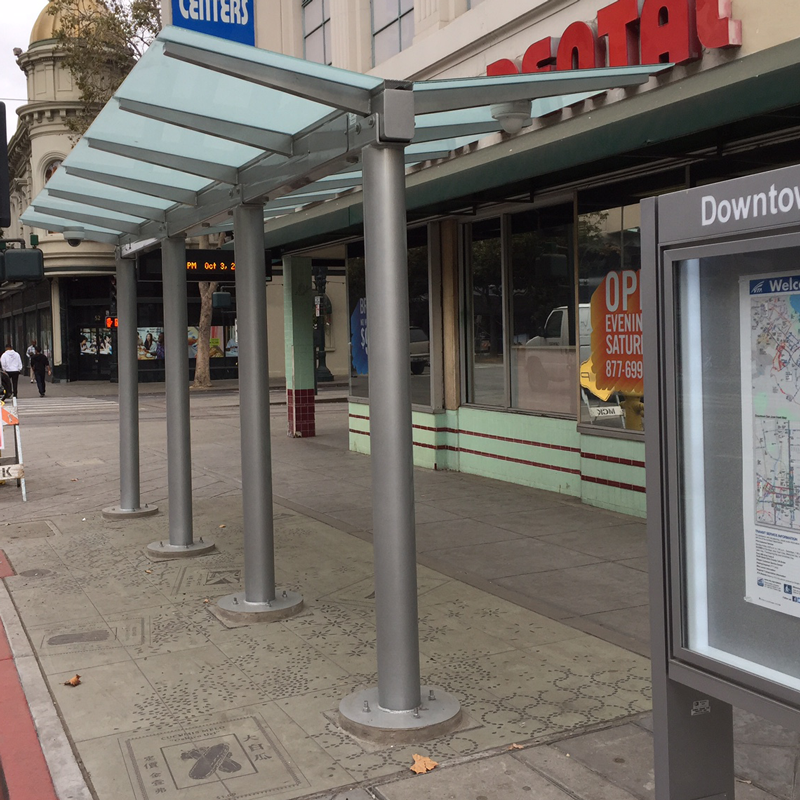 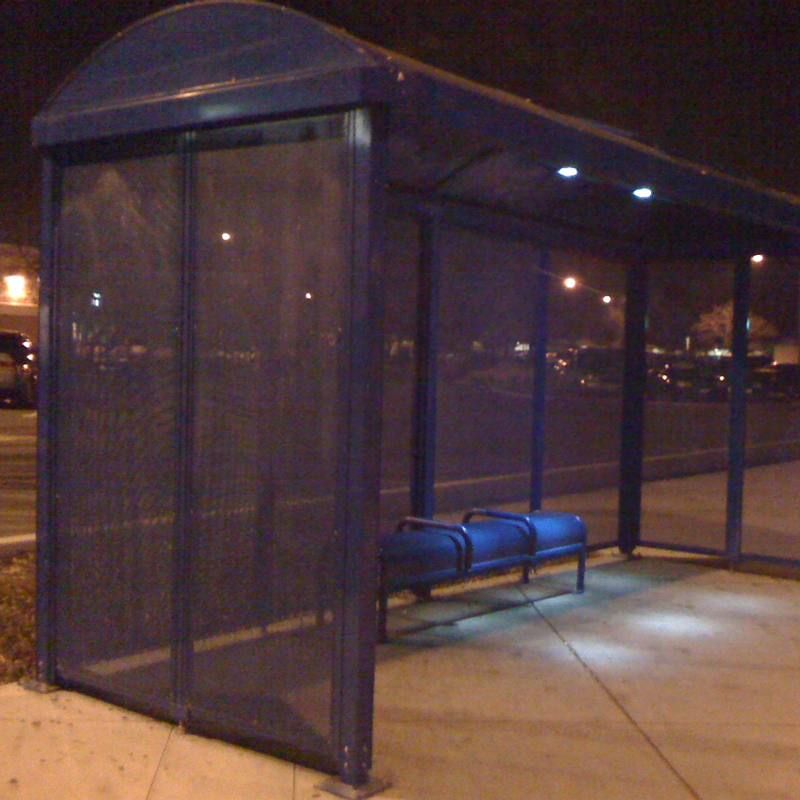 22’ Tolar Signature BRT Transit Shelter Solution for Monterey Salinas Transit’s JAZZ BRT Featuring a fiberglass roof with stainless steel supports, integrated map display, custom glass and bull nose display kiosk.